Sarasota offers visitors a unique angling opportunity; fly fishing Sarasota rivers. While the saltwater fishing gets the attention, Sarasota has some greeat river fly fishing. The Manatee River and Myakka River lie 30 minutes from Sarasota beaches. 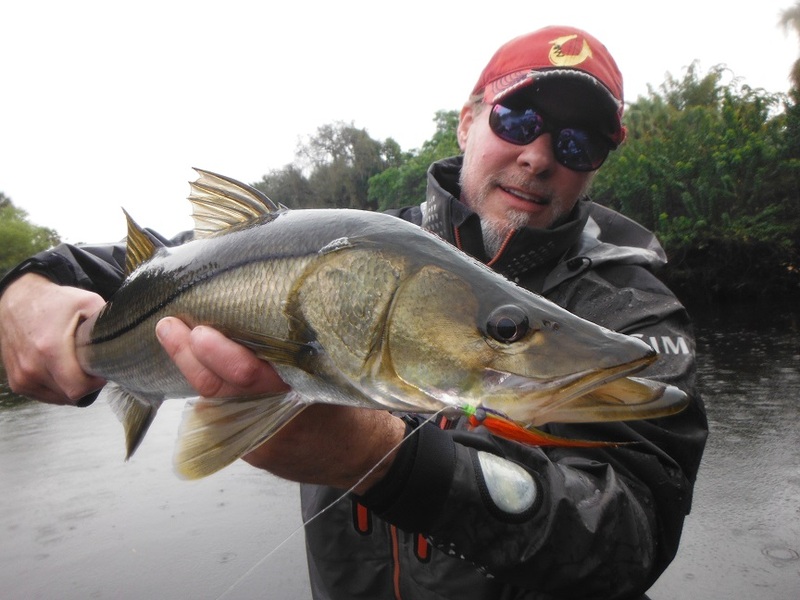 Fly fishing Sarasota rivers gives anglers the chance to catch trophy snook on fly. This occurs in a very interesting and relaxing setting. Other species such as bass, redfish, jacks, gar and more are also available. This happens in the cooler months, usually from mid October to early April. “Oooh, I like the looks of that one!” I said as Ben opened up his fly box for me to inspect. I could tell by the look on his face that he did not share my enthusiasm. It was a white and olive Clouser pattern with a lot of gold flash. Gold is always a good choice when fly fishing Sarasota rivers in the tannin-stained water. “Let’s just give it a half hour or so, and we can change it if it is not producing”. Ben’s opinion of the fly changed shortly as he fooled a feisty little snook in just a few casts and over the next hour landed several more to 27”. The Myakka River holds a lot of snook in the cooler months and it a fairly reliable fishery for anglers taking out a river fishing charter. The Myakka River flows through Sarasota County 10 miles east of Sarasota and Venice, an hour south of Tampa on the west coast of Florida. It eventually flows south and along with the Peace River. 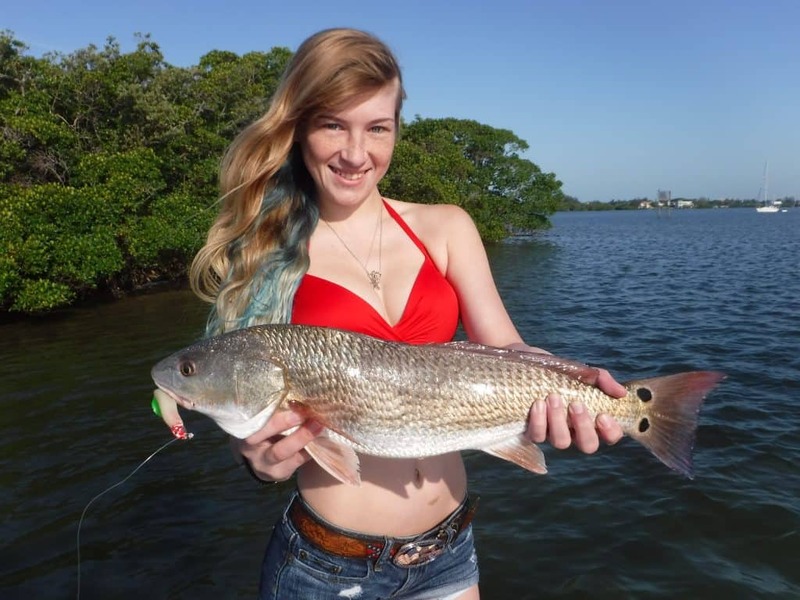 They create a renowned saltwater fishery; Charlotte Harbor. In the summer the water is high and fast from all of the rain, but in the cooler months it settles into a nice tidal river. As the water in the Harbor cools down, snook migrate up into the river to seek sanctuary in the warmer, deeper water. There is also a lot of food (bluegill, tilapia, mullet, fry, and crabs) for them to feed on. For the most part, this is fairly easy fly fishing. Short casts are the norm when fly fishing Sarasota rivers. Managing the back cast is the primary challenge. An 8wt or 9wt outfit with an intermediate sink tip line is a good choice for the river. The leader is simple; just attach a 6’ section of 30 lb fluorocarbon and then tie on a fly. Fly selection is also pretty basic with Clouser patters in darker colors with some gold or rootbeer, along with a “firetiger” fly work well. Tie the fly on a #1 hook using large weighted eyes to get the fly down a few feet. Broad patterns such as Puglisi flies will also fool the wily snook, but are a bit harder to cast and will hang up more often. Floating down the river with the current and casting towards likely fish-holding structure along the shoreline is the most productive technique. Shallow draft boats such as jon boats, canoes, and kayaks perform best, the water can get very shallow in spots. Make a cast, allow a few seconds to sink, then retrieve the fly back in using one foot strips. When a take occurs, use the “strip set” method to hook the fish. Pull sharply with the stripping hand and then raise the rod tip. Jerking the tip up as you might in trout fishing will result in fewer hook-ups. As in all fishing, vary the retrieve until a productive pattern emerges. Again, this is pretty straight-forward fishing and it is mostly a matter of covering the water until a hungry fish is located. Though snook is the primary target, largemouth bass, juvenile tarpon, gar, jack crevelle, tilapia, and other species are frequently landed as well. The Myakka is one of two rivers designated a “Wild and scenic river” in the state of Florida. This means limited access and development resulting in a relaxed and serene experience. The entire river is also a “No-wake” zone. Fly fishing for snook on the Myakka is a unique experience that is a half hour drive from the resort town of Sarasota, but a world away in terms of environment. Access to the Myakka River is limited, this is partly why it remains so remote feeling. 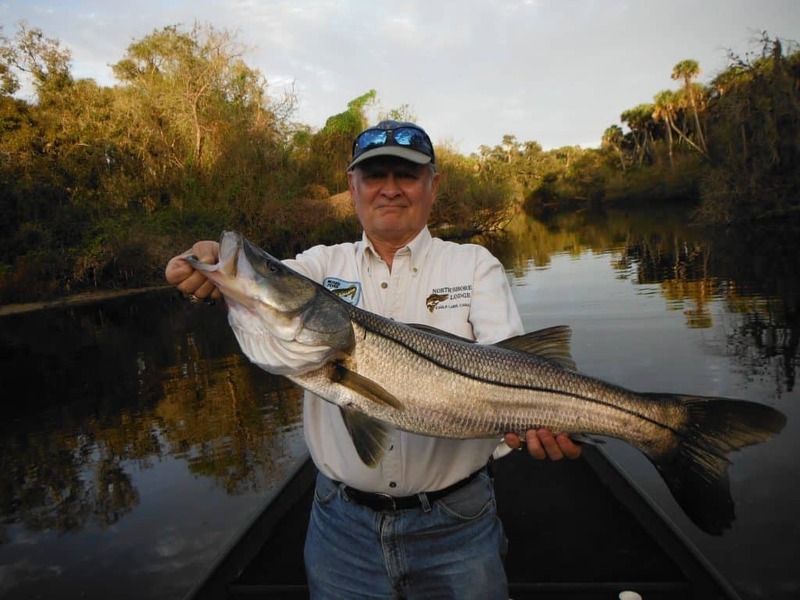 Snook Haven in Venice, Fl offers the bast spot to launch boats to fish the river. It is also a cool little park with a restaurant. Visitors can enjoy lunch after a morning fishing trip. It is also a good place to rent canoes or launch a kayak. 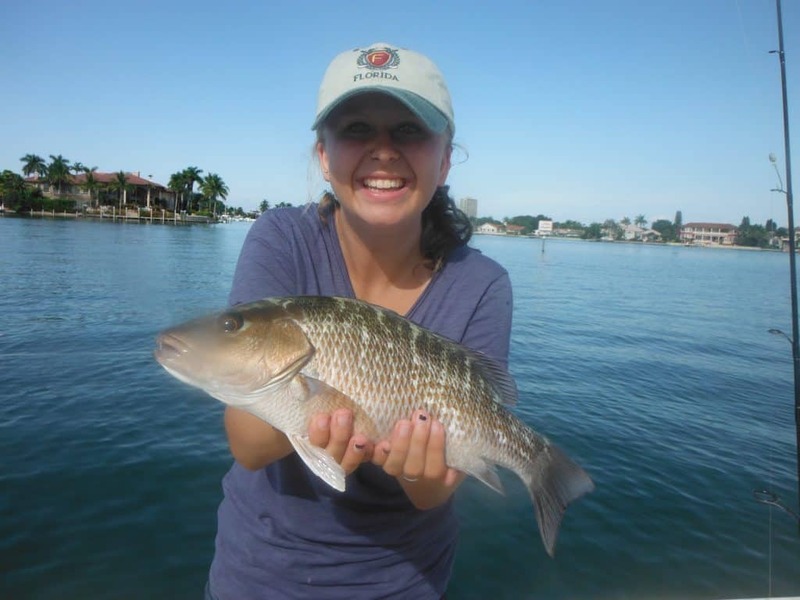 Visiting anglers should give fly fishing Sarasota rivers a try! The Manatee River runs forty five minutes north east of Sarasota. It begins at Lake Manatee and the river flows west from the dam. Much of the river is very shallow and suited only from kayaks ans canoes. The stretch of the Manatee River from Rye Rd to Ft. Hamer is the most productive for fly fishing. Anglers can access the river from a very nice ramp and park at Ft. Hamer. Another more primitive ramp can be used at Ray’s Canoe Hideaway. Ray’s offers canoe rentals along with bait for fishing. 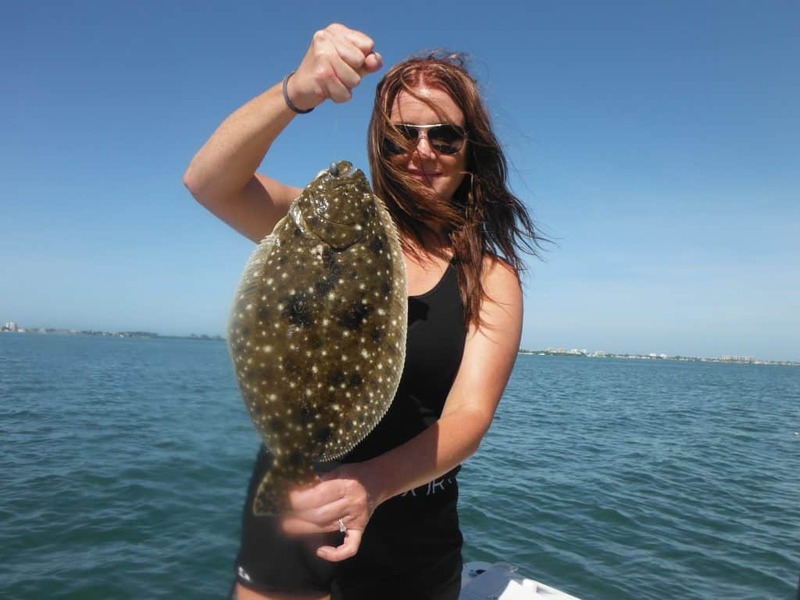 The Manatee River offer anglers the chance to catch the most variety of species. Snook, redfish, jack crevelle, juvenile tarpon, and ladyfish are saltwater species landed. Freshwater species include largemouth bass, catfish, bream, gar, and sunshine bass. The shorter length of the river, freshwater fish washing over the dam, and proximity to Tampa Bay all are factors for contributing to this unique fishery. The Braden river is quite short and is a tributary of the Manatee River. It is purely saltwater and offers anglers the opportunity to catch snook, redfish, and other species. However, the highlight of the Braden River is the consistent fly fishing for large jack crevelle. Jacks put up a tremendous battle on fly tackle! They use their broad sides to pull very hard. Often times, jacks can be seen working on the surface. Snook fishing can be very good, and redfish are caught with regularity. The Braden River is more developed than the Manatee and Myakka. It has a lot of houses and road noise can be heard. The Braden River is also shorter, which can tend to concentrate fish in the deeper areas. It is also the most convenient, being a short drive from Sarasota beaches. There is a ramp with parking and facilities on SR 64 where it crosses the river. It sounds like a contradiction, but often times the largest fish are found in the shallowest of water. While the deeper grass flats hold schools of fish and is a better option for action and numbers. Fly anglers seeking a trophy will do well focusing on shallow grass flats, oyster bars, and mangrove shorelines. Redfish and jack crevelle school up in shallow water, the largest trout are loners and will set up in potholes in shallow flats, and snook will feed on bait in the skinny water as well. This type of fishing has exploded in popularity in recent years. Flats and bay boats abound and kayak fishing is very popular. The result is that these fish receive a LOT of pressure, especially in the popular Tampa Bay and Charlotte Harbor areas. Fish in these shallow areas are spooky and require different tactics in order to be successful. Tackle requirements are similar to other inshore fishing applications, a 7wt or 8wt outfit is fine. Floating lines are used as the water fished is seldom more that 3 feet deep. Longer leaders with a 20lb bite tippet will increase the chances of fooling fish. But, the biggest change in tactics is the need for patience and stealth. Fish in water this shallow are extremely spooky and the slightest noise or shadow can send them running for cover. The most popular fly patterns are Clouser Minnow, Lefty Deceiver, and Crystal MInnow patterns in white or bait fish colors. The approach when attacking a flat or shoreline is similar to that of the deep flats in that the wind and tide are factors that need to be taken into account. Whenever possible, choosing an area where the wind and tide will move the boat in the same direction. Obviously, a shallow draft boat will be required to access these areas. The classic situation is a flats skiff with the angler positioned on the bow and the guide or other angler poling the boat from the stern or poling platform. Many anglers prefer the low, incoming tide when working the shallows. Fish will stage on the edges where the flat drops off, waiting for the water to come up. Fish will then get up on the flat, scatter out, and search for food. Along the same lines, fish will gang up in “potholes”. These are depressions in the flats that can range in size from a foot to to over 20 feet and larger. In both instances, the low water concentrates the fish, making them easier to locate. The more water that there is on a flat the more places the fish can be. Tide strength and heights are crucial elements when fly fishing in the shallows. Anglers need to study the tide charts, it is much more complex than just the times of the high and low tides. The tide height and speed at which it is moving are very important to know so that anglers can understand fish movements. Wind is also a factor; a northeast wind will empty a flat of water while a south wind will flood it. Anglers can choose to either blind cast likely looking areas or sight cast to specific fish or small bunches of fish. As the boat eases down the shoreline or across the flat, the fly is cast towards the shoreline or potholes and grass edges. The fly is allowed to sink a moment, and retrieved back in. Unlike the deep grass flats, the fish will normally be found in small areas and bunched up. It will take time, effort, and patience to eliminate unproductive water. Blind casting will normally produce more fish, but sight casting is very exciting! This is exactly what it sounds like, an angler either readies on the bow while boat fishing or stealthily wades a flat, visually searching for fish. Once sighted, the fly is cast out, taking into account the position of the fish and direction it is moving, and hopefully a take ensues. It can be a bit overwhelming at first, but there are some things that anglers should key on to help locate fish. Edges are always worth investigating, whether it is a weed bad, oyster bar, or drop off. Current edges can also be used as ambush points by predators. Mangrove shorelines are very enticing, but there are miles and miles of them and fish will only be in short sections. The key is to find something different such as cuts, oyster bars, and especially holes and deeper water, fish will definitely hold there. Also, anglers will want to see signs of life; there is nothing worse than a “dead” flat. Areas that show glass minnows and other baitfish, mullet schools, birds, are promising. The best of all flats with fish tailing, waking, or working bait are prime spots. Anglers that are serious about mastering this technique will need to put in their time. Choosing a small area and learning it well is a good investment and will serve the angler well. It is amazing how different these types of spots are with just a little change in tide height. Learning the tides, bottom, and local fish migrations in one small area will help them catch fish in other locations. Wading can be an extremely effective strategy when targeting fish in shallow water, especially once a productive area is located. Some experienced guides will pole an area and not even fish, just look for signs and fish. Once a likely area is identified, they get out of the boat and walk. With the pressure that fish get these days, being able to eliminate boat noises. This will allow fly casters to get much closer to their quarry and have more time to react. Kayaks have become popular are are great tools to use to fish shallow flats. They give anglers access to waters that power boats can’t launch. Kayaks float very shallow and are virtually silent. Anglers can fish from the kayak or use it to get to productive areas where they can get out and wade. They are low-maintenance and effective platforms from which to fish. My Rapala X-Rap landed a foot away from the tree branch and dove down as I began an erratic retrieve. It did not get more than a couple of feet before it just stopped. My initial thought was that I had hung up on the submerged tree, but then the “snag” began to move off. I set the hook and tried to get the fish out of the heavy cover. We had landed a dozen snook that morning, but this felt different. A bulldog battle ensued with the mystery fish making short runs, determined to get back to the safety of the branches. It finally tired and surfaced and I caught a glimpse of green. A bass? If so, it was a nice one. A couple of minutes later that fact was confirmed; it was a beautiful, fat, healthy five pound largemouth! This is what Sarasota river fishing is all about. Florida tidal rivers are unmatched when it comes to natural beauty. 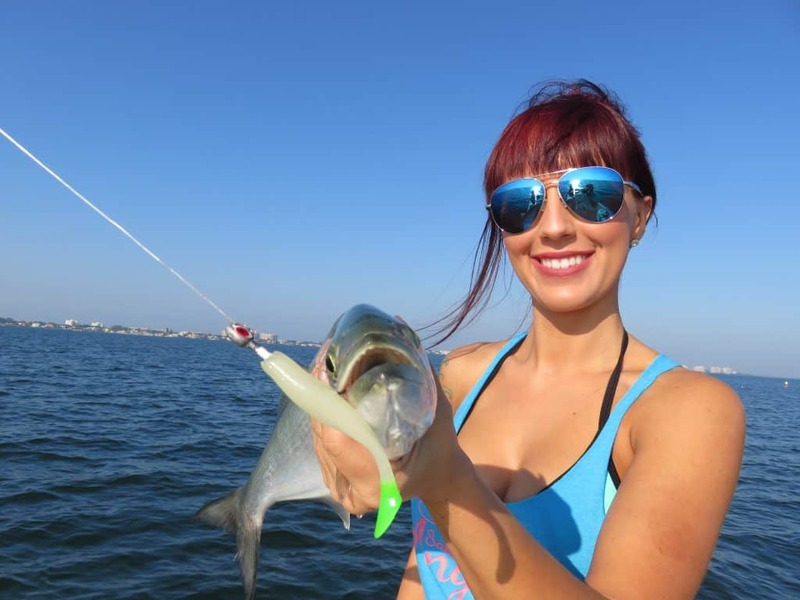 They also offer a unique angling experience; the chance to catch both Florida’s premier inshore saltwater and freshwater gamefish in one location; snook and largemouth bass. In late fall the water levels drop and the rivers become brackish and tidally influenced. This, along with cooling water temperatures, results in a migration of saltwater species such as snook, redfish, jack crevelle, and even tarpon up into the rivers where they co-exist with the resident population of bass, catfish, and other freshwater fish. They will stay there until it starts to warm up, usually mid-March. These same techniques also apply to the numerous creeks and residential canals throughout the area. Most of my days as a professional guide are done in Sarasota Bay. However, I am one of only a couple guides offering fishing charters on local area rivers. This is a specialized type of fishing, best suited to more experienced anglers. Success is less certain than inshore fishing, but the scenery alone makes it worth the trip. My favorite angling technique is casting artificial lures while drifting with the current. An outgoing tide is favorable, though this can be tricky. There are no tide tables to reference this far up most rivers, so an adjustment is made for the closest location. Experience will help determine the correction factor, but two to three hours is generally a good place to start. The direction of the current will determine fish location and lure presentation. Gamefish will position themselves on the down current side of cover, ready to ambush unsuspecting prey. Lures should be cast to the up-current side and worked back with the flow of water. This results in a natural presentation and triggers the most strikes. Soft plastic baits on a light jig head or weighted worm hooks and shallow diving plugs have proven to be the most consistent producers when Sarasota river fishing. Bass Assassin shad tail and 4” jerk baits in dark colors such as “golden bream” and “red shad” on a 1/16 ounce jig head are deadly when twitched along the bottom. If constant hang-ups become an issue, switching to a weighted worm hook and rigging the bait weedless will greatly reduce snags. These lures are a good choice when fish are located or when low water concentrates them in the deeper holes. Rapala X-Raps in gold/black and firetiger mimic the bluegill and tilapia that are the primary forage for larger fish. Both the slender “slashbait” and wider profile “shallow” plugs in sizes (08) and (10) are very good for both bass and snook. Tossing plugs allows anglers to cover water fairly quickly and produces exciting strikes. The multiple treble hooks also result in a good ratio of hook-ups to bites. Suspending baits such as the Twitchin’ Rap and MirroLure can be very effective when fish are finicky. Trolling plugs in creeks and rivers is a technique that has been catching snook for many years. Since all of these waters require motoring at slow speeds, pulling a couple of plugs behind the boat makes sense. Spinnerbaits are also excellent lures in tidal rivers. They have the benefits of both plugs and soft plastics. They are also very easy to use and are a great choice for novice anglers. Basically, the lure is cast out, allowed to sink for a few seconds, and reeled back in with a slow, steady retrieve. ¼ ounce baits with a gold blade with either a chartreuse or golden bream shad tail grub will catch plenty of fish for anglers Sarasota river fishing. Fly fishing on these rivers is challenging, but also very rewarding. A 9 weight rod with an intermediate sink tip line is the best all-round choice. An eight foot 30 lb fluorocarbon leader finishes off the rig. Short casts are the norm, but be prepared for a fair amount of snags. This is a “quality over quantity” situation. Fly anglers won’t normally catch large numbers of fish, but every cast offers the opportunity to hook a ten pound plus snook! Wide profile baitfish patterns such as a Puglisi fly along with traditional snook flies such as the “Crystal Minnow” are good choices. While bass, snook, and other saltwater species get most of the attention, Suncoast brackish rivers offer excellent fishing for catfish, bream, and tilapia. Catfish are abundant and anglers seeking a fish dinner will be successful on most outings by targeting these bottom-dwellers. Catching them is as simple as dropping a nightcrawler or worm down to the bottom on an outside bend with cover. In fact, just about every species that inhabits rivers will fall for a nice fat worm. Shrimp and cut bait will also work. A two pound catfish on an ultra-light spinning outfit is great fun! And great eating! Bream are another species that are relatively ignored on rivers. While their numbers are not great, they are generally above average in size. 10” bluegill are frequently caught. Bream fishing usually improves the farther upstream anglers venture. Live worms catch plenty of fish, but so do artificial lures and flies. I only use two lures when targeting bream; a black 1/16 ounce Beetle spin and a 1/16 ounce jig with a chartreuse curly tail grub. Fly fishermen will be successful using a 3 or 4 weight outfit with a floating line. Best flies are a #10 black spider on the surface and a #8 baitfish pattern for fishing below the surface. Gold with a chartreuse tail and white are good colors to try. These tidal rivers are quite shallow in spots this time of year and a shallow draft boat is required. Most are also “Slow speed zones”, so fast boats and big motors offer no advantage. Jon boats with small outboard and electric motors along with canoes and kayaks are the best choices for fishing. Anglers with bass and flats boats should use caution both at the ramp and on the river, particularly at low tide. Most anglers choose to fish the brackish sections for snook and bass, but the shallow portions up-river all offer excellent freshwater fishing for bream and bass. These areas can be difficult to access due to low water, but they also get very little pressure and offer terrific scenery. The Manatee River from around Ft. Hamer upriver to Rye Rd is the most productive stretch of water. The Lake Manatee Dam is another five miles upriver from Rye Rd. and offers excellent fishing for bream and bass. The two best access points are the ramp at Ft Hamer 1605 Fort Hamer Road, Parrish, FL and Ray’s Canoe Hideaway 1247 Hagle Park Rd. Bradenton, FL. Anglers can purchase bait, tackle, ice, and snacks at Rays, along with canoe rentals and boat launch services. They are closed on Wednesdays. Mark suggests calling him at (941) 747-3909 before coming out to check on the current conditions. 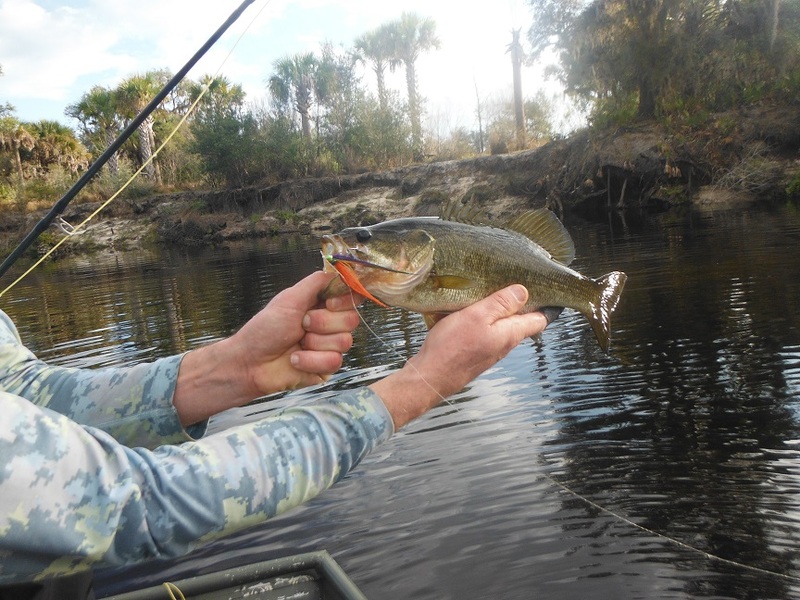 The Braden River feeds the Manatee River just below I-75 and offers excellent fishing from the mouth up to the dam at Lake Ward for snook, redfish, and jacks in the winter. Boats can launch at the ramps at the SR 64 Bridge. The Myakka River is designated a “Wild and Scenic River”, one of only two in the state. As such, access and development have been limited. The area from I-75 south to El Jobean is best for anglers targeting snook. Both bass and snook are plentiful between Border Rd. and Tamiami Trail. Adventurous paddlers and boaters can go upriver to a dam just below Lower Myakka Lake. Ramps for power boats on the Myakka River are at Snook Haven 5000 East Venice Avenue, Venice, FL, Marina Park 7030 Chancellor Blvd, North Port, FL and El Jobean Park 4333 Kerrigan Circle, El Jobean, FL. Anglers who prefer to fish out of kayaks and canoes can also use the launches at either Border Rd or Laurel Rd. “Serious anglers will do better fishing on weekdays. There is a fair amount of boat traffic, including airboats, on the weekends. Snook bite best after some rain when the water levels are up a bit and are caught as far up river as Zolfo Springs. Early fall can be terrific when the tilapia run down river. Bass fishing is good all year long. The best time for bream is in the winter when the water is low and clear on the section up river from Desoto Park. Don’t let jig sizes, colors, and styles confuse you, they all either imitate shrimp or baitfish and are for the most part fished in the same manner. Cast the jig out, allow a few seconds for the it to sink and twitch the rod tip sharply. Let the lure fall on a tight line, most strikes occur as the bait is falling, the helpless look triggers the bite. Keeping the rod tip at ten o’clock and allowing the jig to fall on a tight line will allow anglers to feel more bites. Grubs with a shad tail or curly tail that mimic baitfish can be worked with a steady retrieve. Scented soft plastics such as Trigger-X and Gulp! baits are more expensive but can make a difference on days when the fish are a little fussy. Plugs are another great choice for anglers who prefer to cast artificial lures. Rapala X-Raps in the (08) size are my personal favorite. They cast well and have great action. Cast the lure our and retrieve it back to the boat with sharp twitches followed by a short pause. As in all lure fishing, vary the retrieve until one is found that produces strikes. Set the alarm, get out there early, and experience some action that is as hot as the weather! Here is a list of my 35 best Sarasota fishing spots. 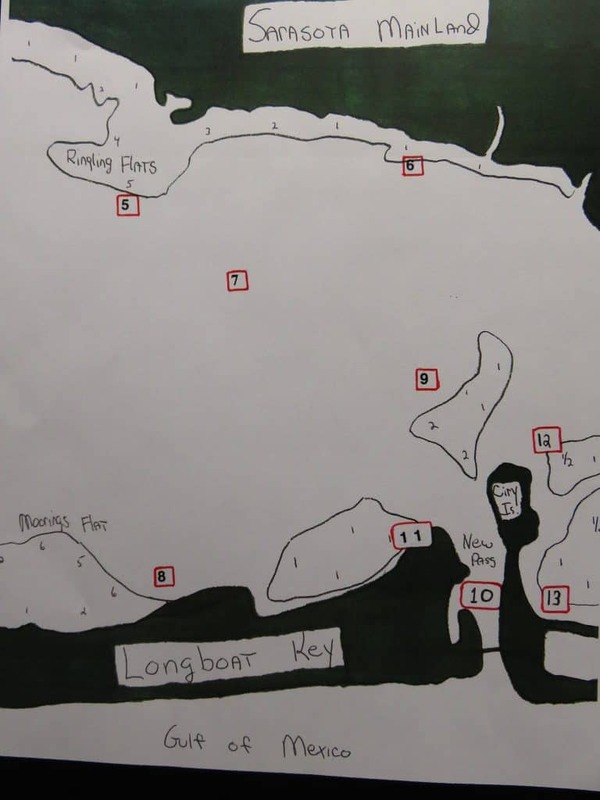 These are places that I fish almost every day on my Sarasota fishing charters, depending on the season and conditions. In order to limit redundancy, I will use the following terms when describing these spots. THIS IS A GUIDE ONLY, DO NOT USE FOR NAVIGATION! “Deep grass flats” are from 4’ to 10’ in depth and will hold speckled trout, Spanish mackerel, bluefish, pompano, jacks, grouper, snapper, sharks, flounder, and ladyfish. Jigs and live shrimp, either free lined or under a cork work well. “Shallow grass flats” are 3’ or less and hold snook, redfish, larger trout, and jacks. Topwater plugs, soft plastic baits on a light jig head or weedless hook, and weedless gold spoons are the best baits. A large live shrimp work very well, too. “Docks” will attract sheepshead, snook, redfish, drum, flounder, and snapper. Live bait works best, with a live shrimp being the best all round choice. Baitfish will produce as well. “Bars” are shallow bands of sand, usually with grass and/or oysters that drop off on one side into slightly deeper water. They attract snook, trout, reds, sheepshead, jacks, and more. All baits can be effective, depending on the depth and species targeted. Most of these are large areas, not one specific spot. Click HERE for current Florida regulations. 1) Long Bar; a very long, shallow bar that nearly crosses the entire bay. Deep grass flats are found on the west end as well. Best on a low, incoming tide. A great spot to fish! Redfish will school up on the south side of the bar on the low, incoming tide. Reds will also be seen tailing on the north side along the shore. Speckled trout are on the deeper grass where the bar drops off. 2) Buttonwood Harbor; a very large area of deep grass with a shoal (shallow flat) on the east end and then deep grass to the south. A white “Shoal” marker makes it easy to find. Lush shallows abound near Longboat Key and are good for snook and redfish on the high tide. Helicopter Shoal is a long, narrow bar several hundred yards to the south. This is a great speckled trout area. A deeper channel runs into the basin of Buttonwood Harbor and is a good winter spot. Another VERY good year-round spot. 3) Bowlees Creek; deep grass surround the mouth of Bowlees Creek and spoil islands and bars line the channel itself. The east side of the bay in both directions has shallow grass flats that drop off and will hold fish at times. 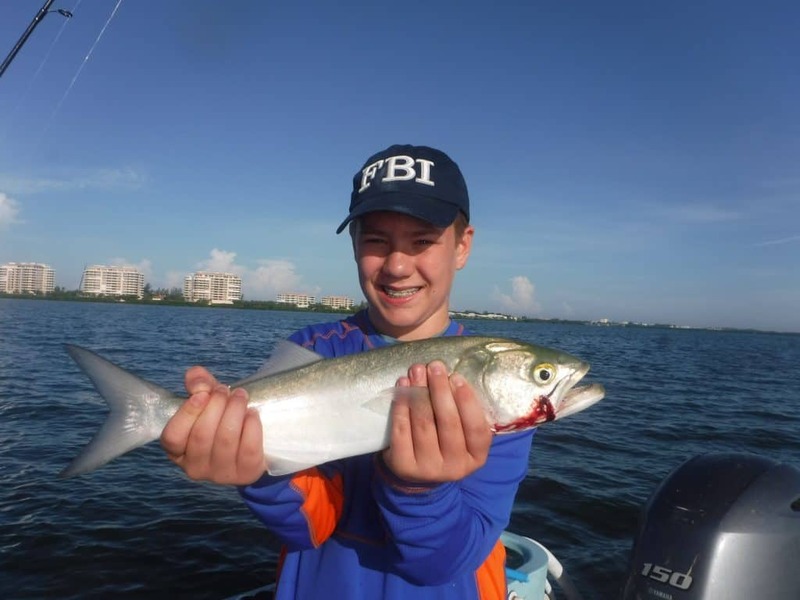 Grass flats out in front hold trout, pompano, and ladyfish. The creek itself is good for snook and jacks in the cooler months. 4) Bishop’s Point; easily distinguished by four large condominiums, Bishop’s Point is a classic point that starts shallow and slowly tapers off into deeper water. Excellent deep grass flats exist on both sides while an excellent shallow flat lies between the bar and the shoreline. Snook and reds will be shallow while the deep flats hold trout and other species. A canal runs inside the point and is a good winter spot. 5) Stephen’s Point/Ringling flats; this is a great spot, particularly for speckled trout. An underwater “hump” exists a few hundred yards from shore with a lot of grass that holds bait and fish. The south end is a bit shallower than the north side. Breaking fish are often found here, including bluefish and mackerel. Bars along the shoreline from the Ringling Mansion north are good for snook and reds. 6) The east side of Sarasota Bay can be good, especially on a hard east wind. Shallow bars with grass and docks drop off into deeper water. Look for bait and birds. Residential canals along here will hold snook and jacks and are good spots on windy days. 7) Hart Reef; 27.22.015/82.34.574 concrete rubble placed in deeper water that holds grouper, snapper, tarpon and more. Reef is in ten feet of water. Anchoring up and bottom fishing with live shrimp or pinfish works best. Gear up for some larger grouper. 8) Country Club Shores/Moorings; a large bar runs parallel to shore here, starting very shallow then dropping off into deeper water with grass growing to 10’. This area will hold a wide variety of species. This is a very reliable “action” spot as so many different species are caught here. An artificial reef lies at the north end of CC Shores and holds bottom fish. 9) Middlegrounds; a fantastic fishing spot! I have spent entire four hour charters without ever leaving this area. The Middlegrounds is a large area of both deep and shallow grass close to the Gulf of Mexico that attracts just about every fish that swims. Trout, bluefish, pompano, mackerel, jacks, ladyfish, sharks, snapper, and even cobia will move into this area to feed. Artificial lures such as jigs will help anglers find the fish. It is a large area to be covered. Free lined live shrimp and chumming with live bait will also certainly produce. The Middlegrounds is one of my favorite 35 best Sarasota fishing spots. 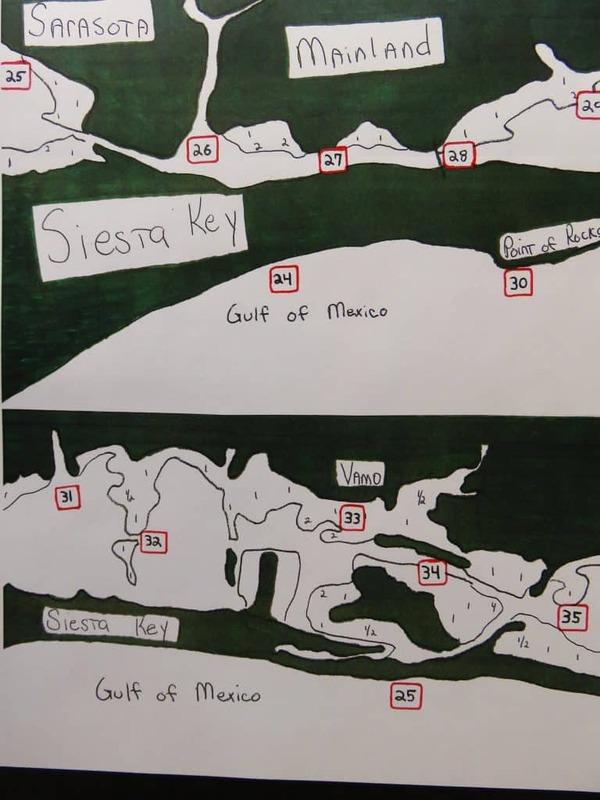 10) New Pass; connects the Gulf and Sarasota Bay and can hold a lot of fish, particularly in spring and fall. Pompano, mackerel, ladyfish, blues and more will be caught in the pass. Structure such as docks and the bridge are good for sheepshead, snapper, and more. Snook school up in the pass in the summer time. Docks on Ken Thompson Island and another park on the north side of the bridge are great places for anglers without a boat to fish. 11) Zwicks Channel; a deeper cut going north, it holds trout in the winter and docks are good year-round. Docks near the restaurant and marina hold sheepshead in late winter and spring. Also a great place to catch white bait. 12) Radio Tower; a large area of submerged grass extending from the anchored sailboats south to the Ringling Causeway, this is another large area that is very productive for a variety of species. This is a good winter spot, for whatever reason. West of the flats is a protected area that is good on a north west wind. It has deep dredge holes along with shallow grass. Pop Janzen Reef lies at the south end. 13) There is a deep channel that cuts through a shallow flat here and can be very good for trout and redfish. Docks along here also hold snook, reds, drum, and sheepshead. A good spot in winter and on a strong northwest wind. 14) Bridges; the Ringling Bridge, “Twin Bridges”, and Siesta Drive Bridge are all good spots to catch fish both day and night. Snook ae caught at night under the lights. Sheepshead, mangrove snapper, and gag grouper will take live shrimp. Jacks can be seen working on the surface. Bay Island Park lies on the west side of the Siesta Drive Bridge and is a handy spot for anglers without a boat. 15) Marina Jacks; an area of submerged grass with a shallower crown just off of the anchored boats. This is another good “action” flat that produces just about every species. Shallow flats to the south off of Selby Gardens are good for snook and reds, as is Hudson Bayou. 16) Marker #5; another good grass flat in 5’ to 7’ of water that holds a lot of fish at times. Speckled trout, Spanish mackerel, bluefish, pompano, ladyfish, and more will hit jigs and live bait. The bar to the south is a good place to catch bait in the summer time. This is one of my favorite 35 best Sarasota fishing spots. 17) Bird Key docks; Bird Key is man-made and the dredging required to do so results in deeper water surrounding the key. Docks line Bird Key and many will hold sheepshead, snapper, flounder, and other structure oriented species. A good, protected spot on north west winds. 18) Otter Key; a deeper dredge area cuts through the keys here. This is a very good winter area. Structure and holes abound and holds many species. Docks and deeper water attract snook, reds, sheepshead, snapper, and more. The Yacht Club Channel can also be good when windy. 19) Big Pass; a veritable fish highway, Big Pass is a fantastic spot to fish! Pompano, mackerel, blues, and ladyfish will be found in the middle and hit jigs bounced off the bottom. Structure such as rocks, sea walls and docks lines the north side of Siesta Key all the way out to the mouth. This deep structure holds snook, sheepshead, snapper, reds, grouper, and drum for bottom fishing anglers. Big Pass is one of my favorite 35 best Sarasota fishing spots. 20) South Lido Park; a great spot for shore-bound anglers, offering access to the Gulf and Big Sarasota Pass. A nice grass flat lies to the southeast and is a great place to wade for trout. The Mercury hole lies to the north. It is a deep dredge hole in a very shallow flat. Be wary of strong tides; do NOT wade out near the point or in the channel! 21) Spoil Islands; spoil islands are the result of dredging the Intracoastal and can be great spots to fish. Snook, snapper, trout, reds, and more will hold here, especially when baitfish are abundant. It is a good spot to catch bait as well. Be careful of shallow water! 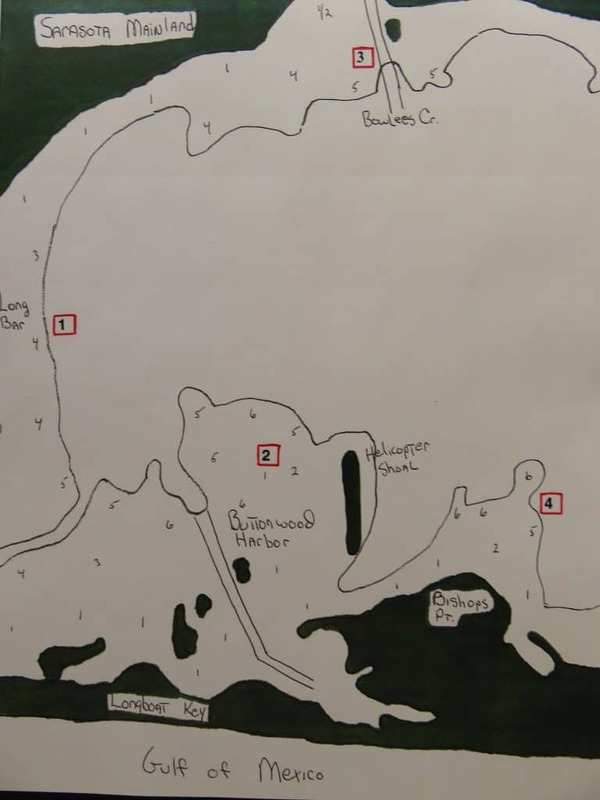 22) Skiers Island; grass flats in 4’ to 6’ of water surround the island, as well as nice oyster bars to the north. The Grand Canal is a good place to fish docks and to troll. 23) Bars and shallow grass good for trout, snook, and redfish. High tides are best. Docks along the shoreline hold snook, reds, snapper, and more. 24) Beaches; area beaches are probably the best bet for anglers fishing from shore. Whiting, silver trout, flounder, and sheepshead will take shrimp or a small jig in the winter. 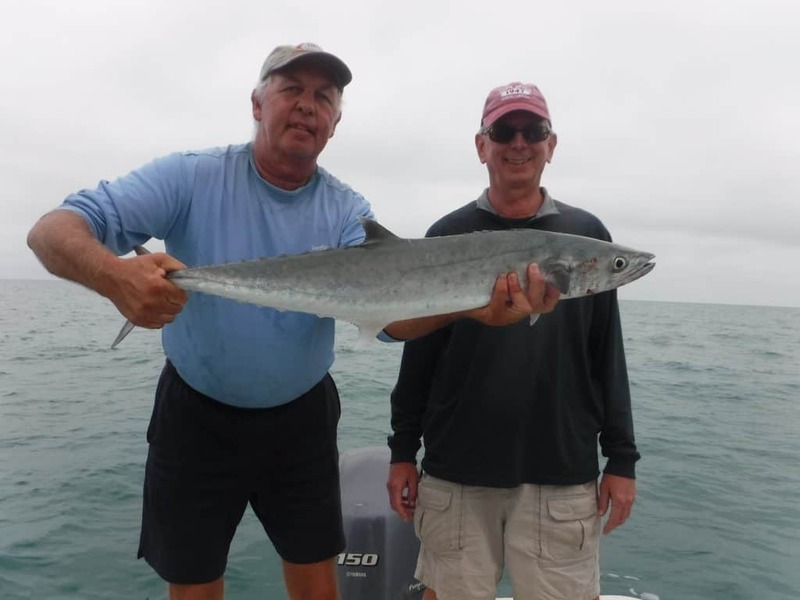 Spanish mackerel, ladyfish, bluefish, jacks, and more will be found in spring and fall. Sight fishing for snook can be fantastic in the summertime. Anglers in boats will catch mackerel, kings, false albacore, sharks, tarpon, and other species. Surface action for mackerel and false albacore can be fantastic in the spring and fall. The beaches are one of my favorite 35 best Sarasota fishing spots. 25) Field Club flat; an area of scattered grass in 4’ to 6’ of water, getting very shallow at the south end. This is a good area on a strong north east wind and incoming tide. Docks will hold fish as well. 26) Phillippi Creek; a VERY good place to fish in the cooler months. Jacks, snook, snapper, sheepshead, drum, and more will inhabit the creek. Live shrimp works well as does shallow diving plugs. Snook and jacks will migrate a long way up the creek if it gets cold. It does get shallow in spots so caution is required. High, afternoon tides are best in winter. Phillippi Creek is one of my favorite 35 best Sarasota fishing spots. 27) This stretch of the Intracoastal has a lot of rocky ledges that are good for snapper and sheepshead. It is another good, protected winter spot. 28) Stickney Point; a park just south of the bridge offers access to shore-bound anglers. Fishing from the bridge itself is also permitted. Snook, ladyfish, jacks, and bottom fish are the main targets. Very good at night for snook and snapper. 29) A nice little flat lies southeast of Stickney Point and will hold snook, redfish, and trout. Incoming tides are best. The small creek is good as well, but is quite shallow. 30) Point of Rocks; the best beach spot in the area, offering great fishing when conditions are right. It does require a little walking as access is limited, but it is worth it. 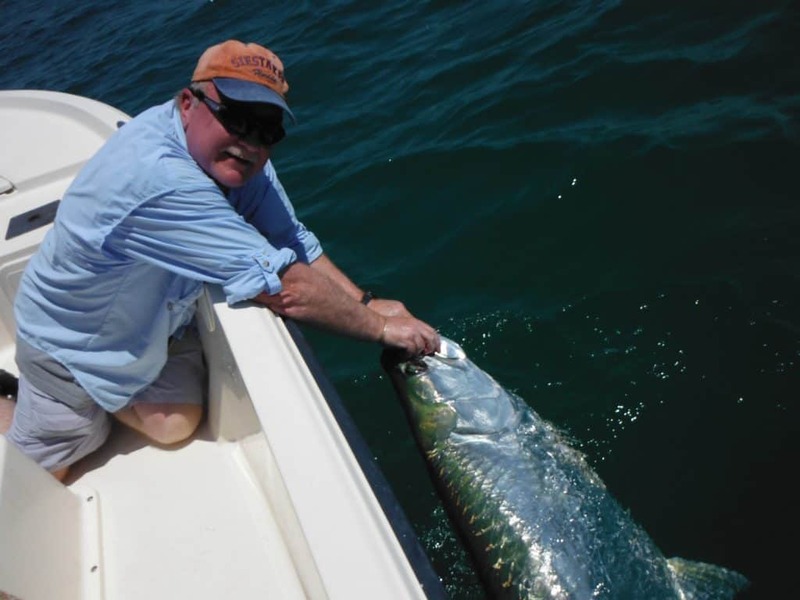 Tarpon anglers congregate there in May and June. Spanish mackerel and other species school heavily in spring and fall. 31) Nice bar and grass flat east of Marker # 51, good for trout. Bars will hold snook and redfish. 32) Bars on both sides of the bat at Marker #50 are very good. Fish shallow for snook and reds and the deeper edges for speckled trout. 33) Vamo; nice shallow bars and grass with access to North Creek just to the south. There is a park that is a good place to wade or launch kayaks and canoes. 34) Neville Preserve; good grass with sharp drop-offs, fish will school up in the channel. It is another good winter spot, fish will concentrate in the channel. 35) Flats and bars south of Spanish Point on both sides are good for a variety of species, mostly ladyfish and speckled trout. Shallow bars hold snook, reds, sheepshead, and jacks. Best on the higher tide stages. I have been running Sarasota fishing charters since 1991. We are fortunate to have many different species that we catch in Sarasota Bay. 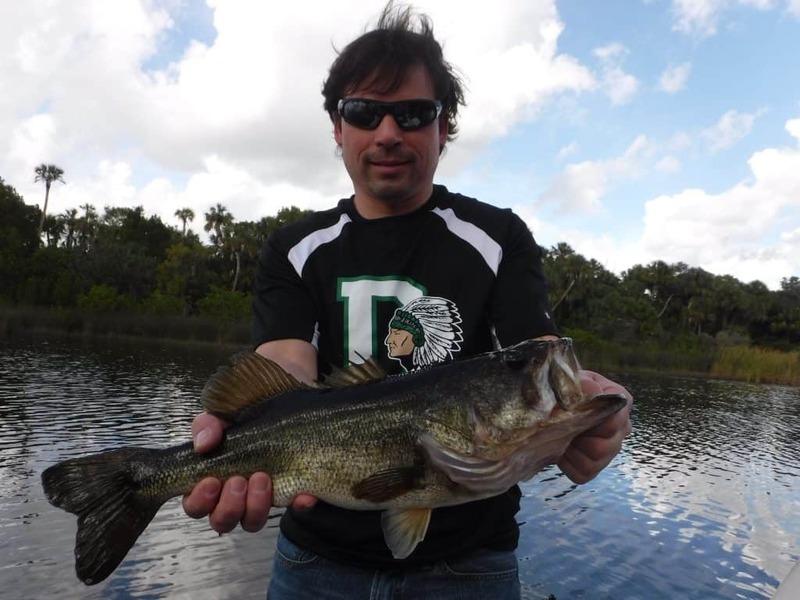 I am going to list my personal top 8 Sarasota fish species. As with all lists, this one is subjective. My criteria are fighting qualities, willingness to take a lure or fly, year long availability, and food value. The first three are obvious choices; snook, trout, and redfish. The others may surprise some anglers. The top 8 Sarasota fish species are snook, speckled trout, redfish, Spanish mackerel, jack crevelle, pompano, bluefish, and mangrove snapper. These fish species all fish hard, take both live bait and artificial lures, and are available most of the year. All but jacks are very good eating as well. Candice is a local model that I have worked with on numerous articles and projects. Since she has caught every species on this list, I am going to use her to show off each species. As with anything, opinions vary on “best”. That applies to food value as well, we all have our own tastes. The mighty snook is without a doubt the premier inshore game fish in Sarasota. It is #1 on my list of top 8 Sarasota fish species. Snook check all the boxes. They put up a great fight, hit lures and flies, and are available year-round. Snook also taste great, but I release them all to live another day. Snook make a seasonal migration in Sarasota. They winter in creeks, rivers and residential canals. These areas are warmer, deeper, and have forage to feed on. As it warms up, snook move out into the bays and inshore waters to feed. As summer approaches, snook move out into the passes and out on the beaches to spawn. By late summer, they begin to reverse the process. River snook fishing is one of my favorite Sarasota fishing charters. I use my 14′ Alumacraft Jon boat in the area rivers. Anglers cast Rapala plugs in search of a trophy river snook. The Myakka River, Braden River, and Manatee River all hold snook, as well as other species. Snook are really a saltwater version of largemouth bass. They have a large mouth to inhale prey, are structure oriented, and have a broad, powerful tail. Most of the popular snook lures started out as bass lures. Topwater plugs, diving jerk baits, spinnerbaits, and soft plastic baits all fool snook. Fly anglers score using small, white bait fish imitations. Live bait works very well for snook. A large shrimp is deadly fished near docks and bridges. Pinfish and grunts will catch some larger specimens. Chumming with scaled sardines (AKA greenbacks, shiners, white bait ) is a deadly, proven technique. 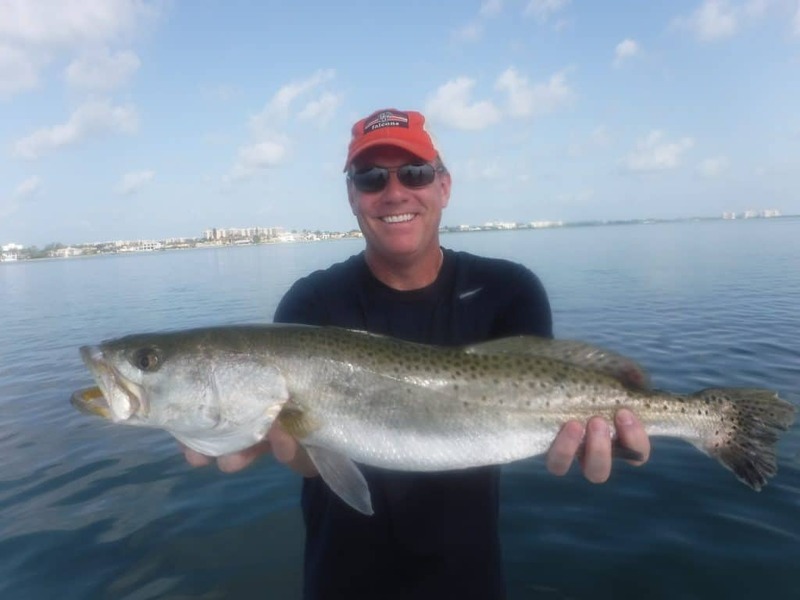 I am putting speckled trout in the #2 spot on my list of top 8 Sarasota fish species. While trout are not the greatest battlers in the water, they make up for it in terms of numbers, availability, aggression, and table fare. They are also a beautiful fish. Speckled trout are available all year long. They are abundant on the grass flats from very shallow up to ten feet of water in the warmer months. The majority of speckled trout caught in Sarasota are done so by anglers fishing submerged grass in five feet to ten feet of water. Jigs and live shrimp account for most of the trout caught. In winter they will seek deeper holes, including channels and residential canals if the water temperature gets into the 50’s. Trout will hit a wide variety of artificial baits, with the jig and grub being the most popular artificial bait. Fly anglers will catch them using Clouser Minnow patterns and sink tip lines. Live bait is also extremely effective for speckled trout. Shrimp are the top bait as they are available at local bait shops all year long. Live bait fish also work well and will produce larger fish. A small 2 inch to 3 inch grunt is a fantastic bait for large trout. Pilchards also work very well. Speckled trout are outstanding table fare! The limit is 15” with one fish over 20”. However, I release all trout over 20”. They are breeder fish, we need them in the water to sustain the fishery. 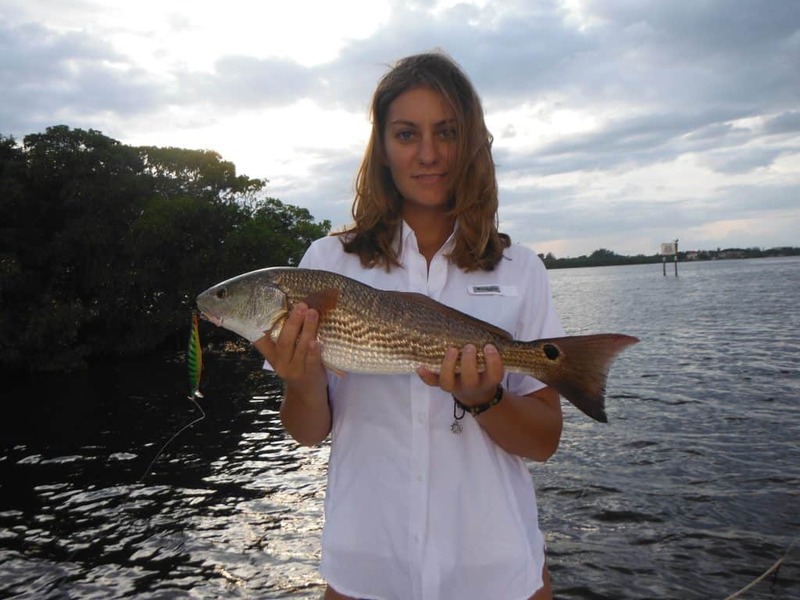 Redfish are #3 on my list of top 8 Sarasota fish species. Some anglers may be surprised to see trout ahead of redfish on my list. The primary reason is that redfish numbers have been down the last several years. For whatever reason, the fish are spawning, but the juvenile fish are not growing. But, redfish are strong, take lures and live baits, are available all year, and taste great. In the cooler months, reds are caught under docks and around other structure, including oyster bars, bridges, and rocky shorelines. As the water warms up, the fish move out onto the shallow grass flats. Reds are caught in very shallow water. They are also quite spooky and skittish in this very skinny water. Patience, stealth, and long casts are required. Gold weedless spoons are a top artificial bait. Soft plastic baits rigged weedless are also very productive. Live bait is difficult to fish in the very shallow water, although fishing potholes with live shrimp works quite well. Chumming with pilchards will also produce fish. In the late summer, redfish school up into big numbers. They can be easily seen on the shallow flats when the surface is calm. This is the best time of year to target reds. They school up before moving out into the Gulf of Mexico. Many of these fish are “over slot”, meaning larger than the 27” maximum size to keep. Anglers must be patient, these fish are easily spooked! 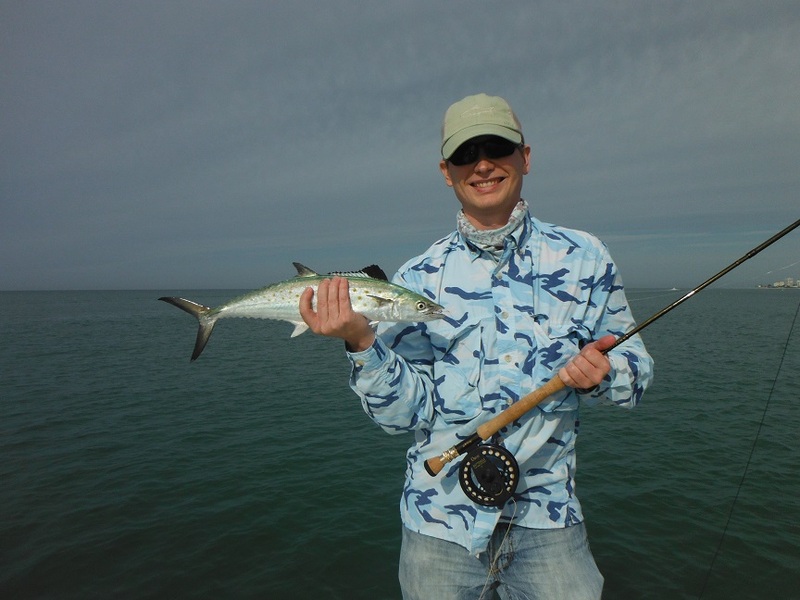 Spanish mackerel are #4 on my list of top 8 Sarasota fish species. Spanish mackerel are a very under rated game fish, in my opinion. They are extremely fast and make blistering runs. They take lures and flies with reckless abandon. Mackerel are very good when eaten the day they are caught. The only reason they are this far down is that they are around all year long. If the water is too warm or cool, their numbers decrease. Spanish mackerel can be caught in a variety of ways. Trolling with spoons and plugs in Sarasota Bay and in the Gulf of Mexico produces a lot of fish. Anglers also do well in the passes and over the flats casting jigs, plugs and spoons. Fly fishers score using white D.T. Special and Clouser Minnow flies. No matter what the lure or fly, a fast retrieve usually works best. Live bait is very effective as well. Free lined live shrimp do well on the flats and in the passes. Also, while Spanish mackerel can be difficult to locate and catch in the summer, chumming with live bait will get them fired up. It is the only reliable technique for catching them in the warmer months. Mackerel school up in large numbers in the inshore Gulf of Mexico. They can be seen feeding on bait fish right on the surface. Working “breaking fish” in the Gulf is great fun! Mackerel will instantly take any lure or fly that resembles a small bait fish. Jack crevelle are #5 on my list of top 8 Sarasota fish species. Jacks are the bull dogs of the bay. They rarely leap, instead using their broad sides and forked tail to pull relentlessly. Jacks take artificial baits and flies viciously. Most of the time jacks are encountered in schools. They are quite aggressive when schooled up and are very competetive. Jacks do not have food value. If they were good to eat, they might be #1 on my list! 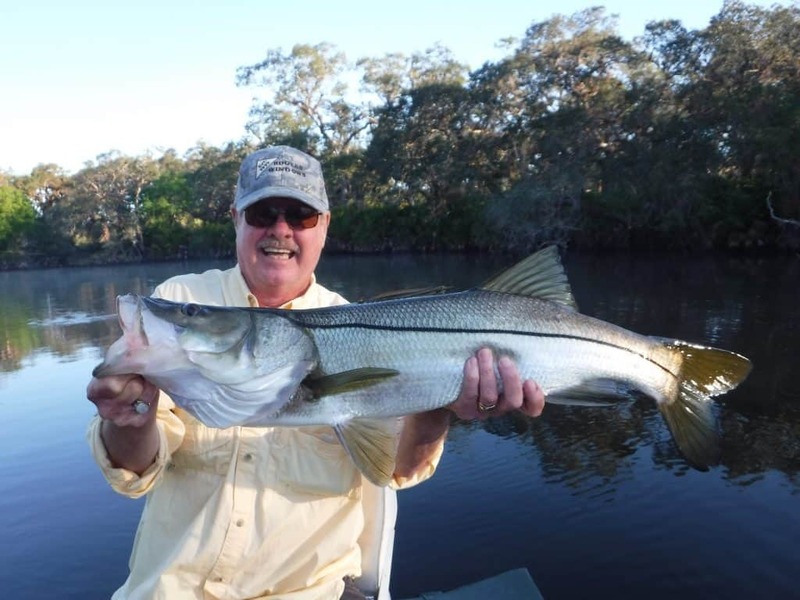 Like snook, jack crevelle will congregate in Sarasota canals and creeks in the cooler months. Phillippi Creek, Hudson Bayou, and Whittaker Bayou are good spots, as is the Grand Canal on Siesta Key. Trolling small plugs such as the Rapala X-Rap in the 08 size is a good way to locate fish. I usually catch my largest fish in the winter. The same rivers that hold winter snook also will attract jack crevelle. As it warms up, jack crevelle move into the bays. They move around a lot and are found around oyster bars, seawalls, bridges, and open flats. They are caught blind casting, but it is much more fun to cast to schools of fish breaking on the surface. Area bridges will also hold some big jack crevelle. Most of the jacks that are caught by clients on my Sarasota fishing charters hit artificial lures. Rapala plugs fool them in the rivers and creeks. Plenty of jacks, though normally smaller, take jigs while drifting the open flats. Chumming mangrove shorelines with pilchards will attract jacks while snook fishing. 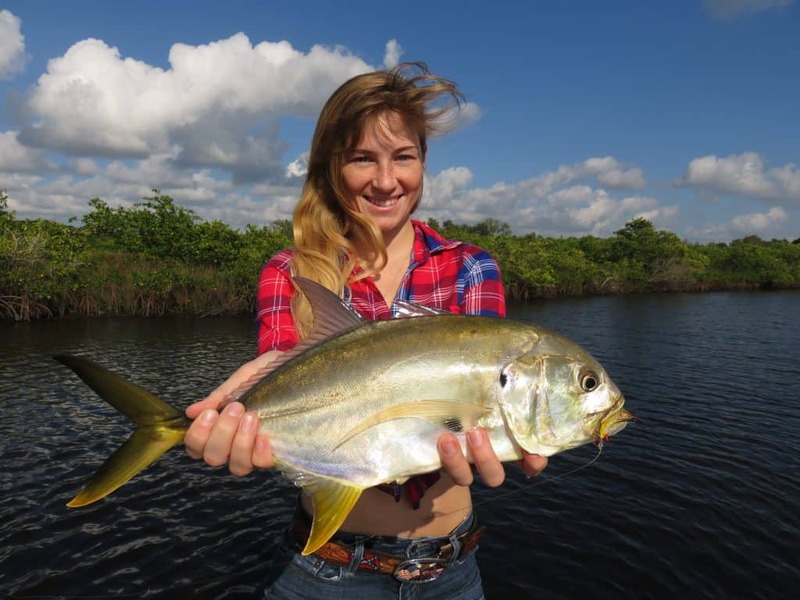 Pompano are #6 on my list of top 8 Sarasota fish species. 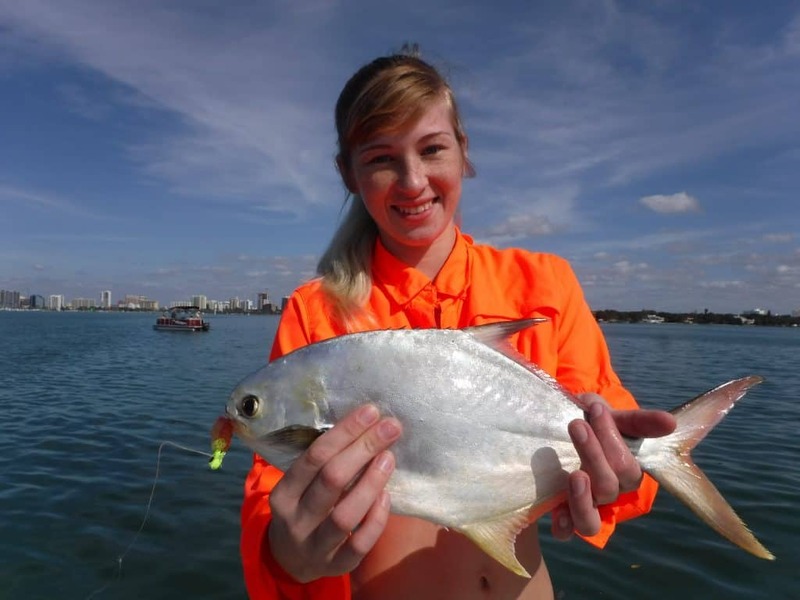 Most pompano are caught by anglers using jigs and live shrimp. Pompano pull incredibly hard for their size. Also, they are some of the finest eating there is. Pompano are definitely my favorite fish to eat. Their only failing is that they are not around all year long. Then tend to move through in “runs”. Both Big Sarasota Pass and New Pass are good spots to target pompano. A small jig with a heavy head will get down quickly in a strong current. The jig is then bounced up in short motions. This vertical jigging is very efficient as the bait stays in the strike zone as the boat drifts. It is a great way to cover a lot of water and locate fish. Pompano are also encountered on the deep grass flats. Anglers casting jigs catch them while trout fishing. 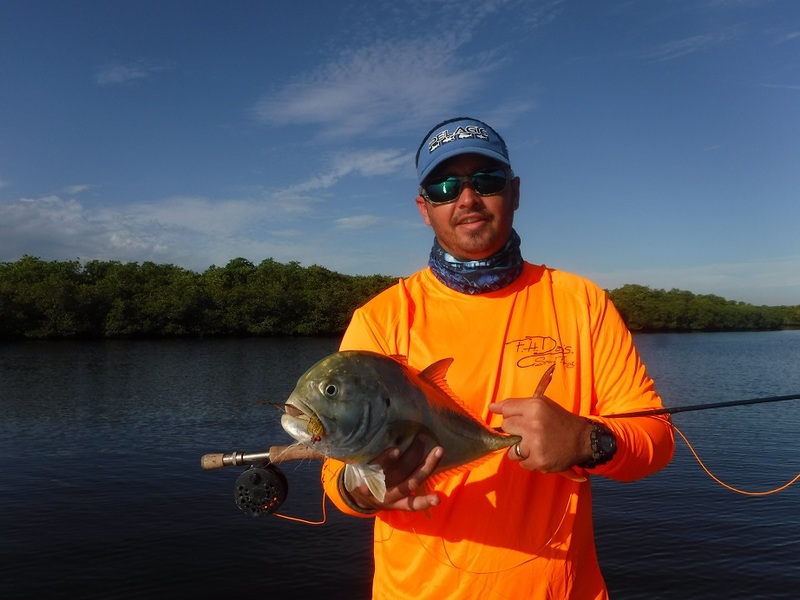 The same jigs that produce trout, mackerel, and other species will fool pompano. Also specifically targeting pompano can use the same jigs that work well in the passes. 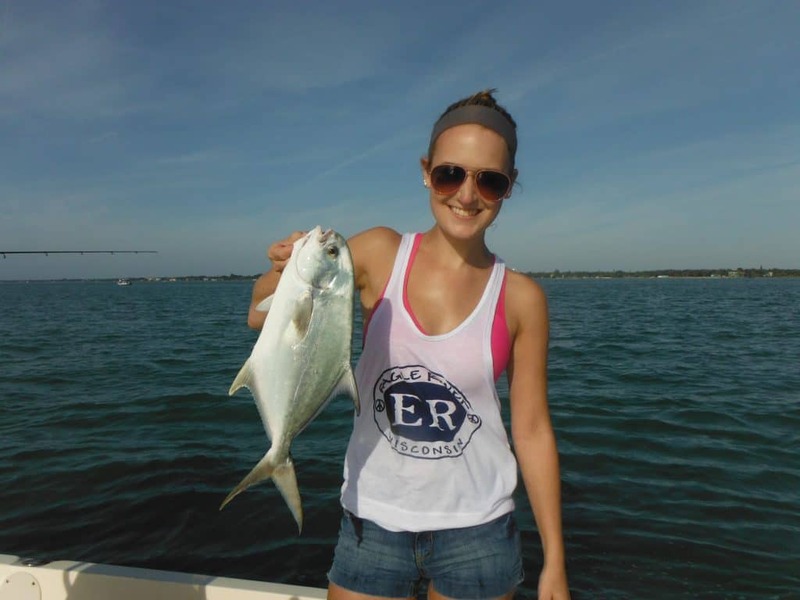 Bluefish are #7 on my list of top 8 Sarasota fish species. 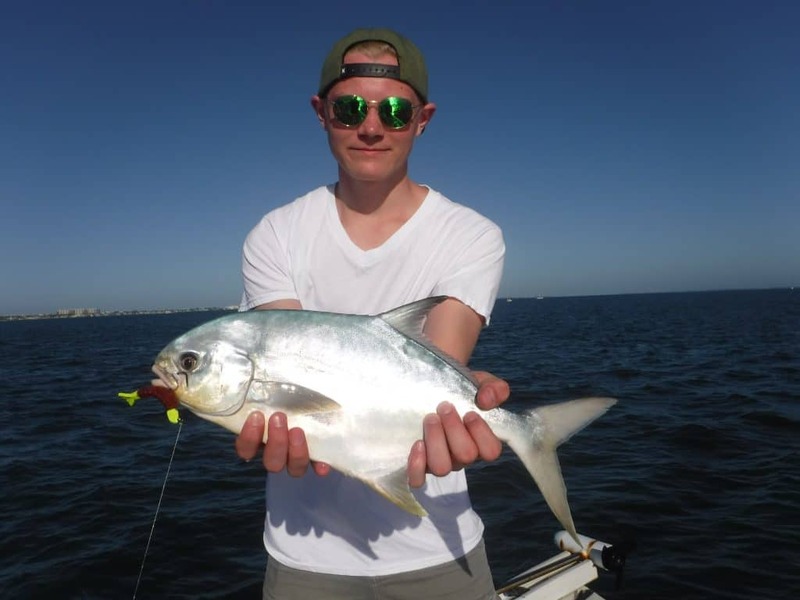 North east anglers are very well acquainted with bluefish as they are popular all along the Atlantic coast up to Maine. Our bluefish are smaller, five pounds is a nice one. Blues fight very hard, assault lures and flies, but are only available at certain times of the year. Also, they are only considered fair on the table, though if cared for properly, they are pretty good. Bluefish should be bled out and iced right away, this will make the flesh less dark and strong. Bluefish can be anywhere or nowhere. They are found both in the passes and on the grass flats. Jigs, plugs, spoons, and flies will all elicit strikes from aggressive bluefish. Live shrimp will also fool them, as will any small bait fish. I catch them in the summer chumming the deep flats as well. Mangrove snapper round out my “great eight” list of top 8 Sarasota fish species. Snapper are fantastic eating, pull hard, and are available year round. While clients catch snapper using lures, the majority of fish are taken using live bait. Small Rapala X-Raps and jigs with a Gulp Shrimp catch the majority of snapper that fall for lures. Mangrove snapper are caught along the mangrove shorelines. However, for the most part, anglers targeting snapper fish man made structure. Bridges, docks, sea walls, and rocky structure all hold snapper. A live shrimp lowered down near and of the above structure can result in a feisty snapper being hooked. In the summer, we catch some very nice snapper chumming the deep grass flats. This really started several years ago. I have no idea why, but they are certainly most welcome! At times the mangrove snapper actually prefer dead bait and chum. Some bait almost always dies and sinks to the bottom of the well. I use this as both chum and bait to attract and catch snapper. At times a switch to smaller hooks and lighter leaders is required. I hope you enjoyed my list of top 8 inshore species, along with the tips and locations. I have fished 200 days a year for over twenty years now. These are the fish that my clients and I enjoy catching in the inshore waters of Sarasota. Any angler who would like to experience a Sarasota fishing charter can e-mail or call me! Clients on Sarasota fishing charters did well this week once again on the deep grass flats. Many species were landed Sarasota jig fishing and chumming with live bait fish. Snook were also caught in New Pass. 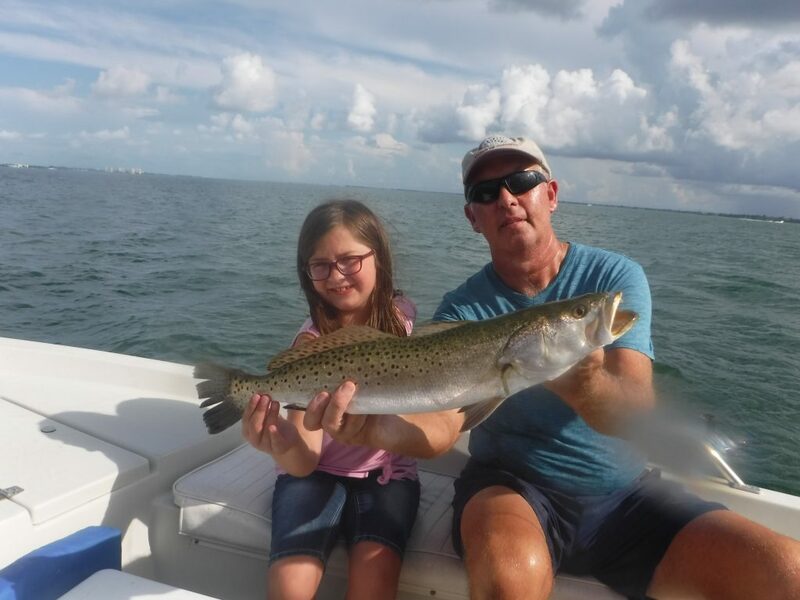 Speckled trout, Spanish mackerel, bluefish, flounder, gag grouper, mangrove snapper, jack crevelle, whiting, ladyfish, catfish, and more were landed by anglers on Sarasota fishing charters this week. The Radio Tower, Middlegrounds, and Bishop’s Pt were the top spots. Casting jigs at first light then switching to live bait mid-morning was the most productive pattern. I fished docks in New Pass one morning in search of snook. We landed one and had another hit a topwater plug. The wind and rain showed up, so we headed in early. Family fishing is a big part of my business this time of year. 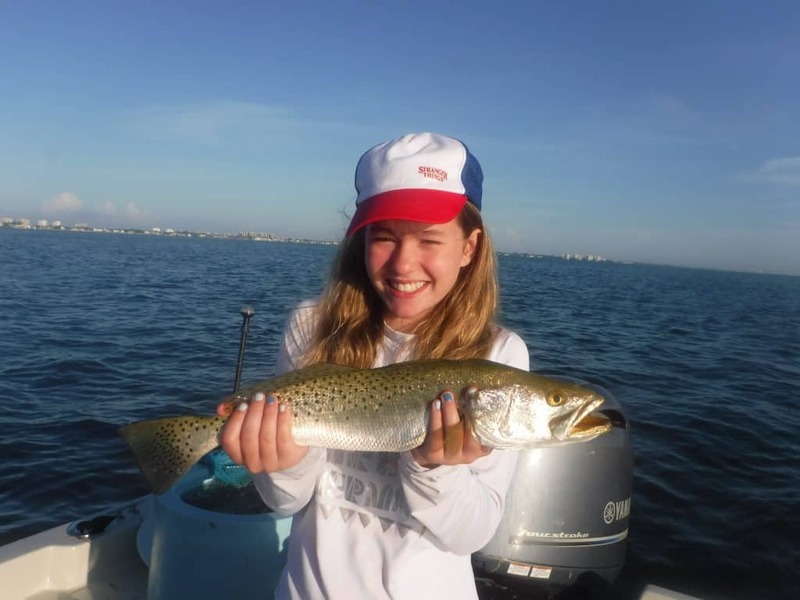 My Sarasota fishing report usually includes children catching fish and having fun. As a fishing guide I need to adjust my techniques and tactics to my clients experience and skill level. Live bait is a great equalizer. Once fish are chummed up behind the boat, they are easy to catch. Anglers only need to cast fifteen or twenty feet behind the boat to catch fish. Jigs have been performing very well for me, especially early in the morning. 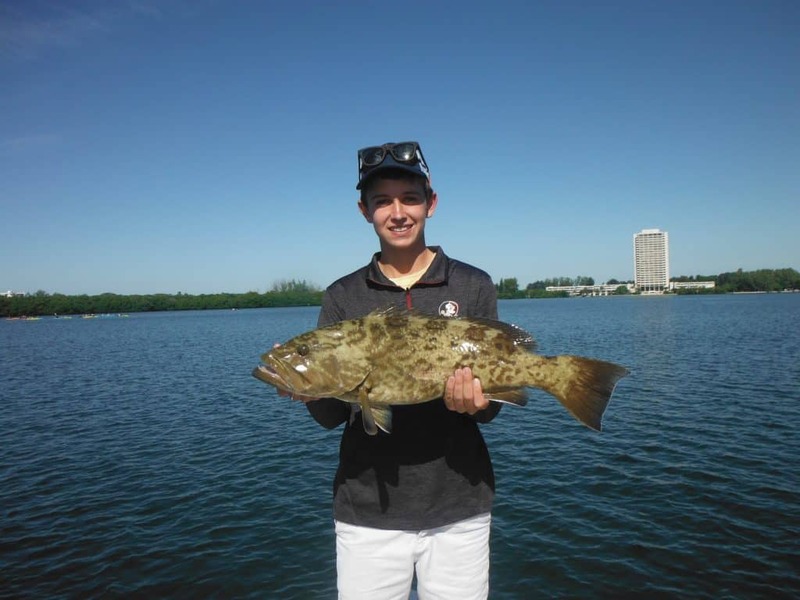 While it might seem more difficult, Sarasota jig fishing is actually quite easy. I can usually work with a client for fifteen minutes, even young anglers, and get them catching fish. Gulp Shrimp are almost like using live shrimp, they are that effective. In some ways they are even better. Pinfish destroy live shrimp in short order, the Gulp Shrimp last longer. Jigs are the most effective all-round fishing lure in Sarasota and all along the Gulf Coast. A jig is simply a hook with some lead weight at the front and a tail made of hair or plastic. It is simple but extremely effective. The jig dances seductively in the water. It is jerked up sharply then falls helplessly, triggering strikes. Weights and tails are matched to the conditions fished and targeted species. Jigs will catch virtually every species on my Sarasota fishing charters. There is evidence pointing to the jig as the first artificial bait used by man. And after all these years, it still catches fish! Like many other lures, they come in a myriad of styles and colors, but they can really be broken down into two types; hair and plastic tailed jigs. A painted lead head jig with a plastic body is the most popular of the two here on the Gulf Coast. They are inexpensive, easy to use, versatile, and productive. Jig heads come in many colors, but white and red are the two most popular. ¼ ounce is the most popular and versatile weight for jig heads. A heavier jig head is required occasionally, such as when fishing deeper water or in strong current. Jigging the passes would be an example of this. 1/8 ounce and even 1/16 ounce jig heads will be used in very shallow water. Tails also come in various shapes, sizes, and colors. Shad and curly tail baits imitate fish while paddle tail and shrimp bodies mimic crustaceans. Both catch plenty of fish. I like Bass Assassin products, but they are by no means the only choices. A basic color selection of white, gold, olive, root beer, and chartreuse in both bait and grub style will cover most situations and angler will face. One advantage of these types of jigs is the ease with which tails can be replaced and colors changed. They are also very economical. This versatility along with the low cost certainly adds to the popularity of Sarasota jig fishing. I use shad tail jigs most of the time. The Bass Assassin 4” Sea Shad is my favorite soft plastic jig trailer. The main reason I prefer shad tail baits is that they have great built in action. Shad tails have a very realistic swimming motion. This makes it a great choice for novice anglers. Shad tail jigs are very versatile. They produce for anglers using multiple retrieves. A steady retrieve will mimic a bait fish. The shad tail produces a lot of action. However, the most productive retrieve is the “twitch and fall” technique. The jig is cast out, allowed to sink, then retrieved back using a sharp one to two foot movement. Most strikes occur as the jig falls. Paddle tail and shrimp tails work well, too. One benefit to these baits is that pinfish and other small fish won’t bite off the end of the tail. These baits work best when the water is cooler and there are more shrimp and less bait fish in the water. Cooler water will also result in fish being more active and aggressive. They will be more active and will readily take a jig. Scented soft plastic baits such as Gulp are a bit more expensive, but on slow days they can make a big difference. I have had many charters where the Gulp and jig combo out-fished live bait. Color seldom matters, it is all about the scent. The 3” Gulp Shrimp is a perfect size for Sarasota Bay species. Jigs can also be purchased that are manufactured with nylon or natural fibers. Bucktail jigs have been around a long time. White is the best color. Spro jigs are a quality bucktail jig that is an excellent lure. Pompano jigs are usually made with artificial fibers. Typically, they have a heavy head and a short tail. While very productive, hair jigs are not as durable or cost effective as the jig and grub combo is and therefore not as popular. They are a great choice for pompano and speckled trout, but not for bluefish and mackerel. Both Big Sarasota Pass and New Pass can be great spots to do some jig fishing, as long as the water is clean. Both passes have shallow bars and deep channels and fish can be in either of those spots. In the deeper water, vertically jigging while drifting with the tide is a time-proven technique for pompano and other species. Anglers simply drop a jig to the bottom and drift along while sharply raising the rod tip every couple of seconds, then allow the bait to flutter back to the bottom. Heavier pompano style jigs work very well in this application. Each time the bait hits the bottom it will kick up a puff of sand, imitating a crab or other crustacean. A small piece of fresh or frozen shrimp can be added. This is called “tipping the jig”. On the shallow bars, casting jigs out and retrieving them back to the boat is the preferred method. Each time the jig hits the bottom, it kicks up a bit of sand. This looks exactly like a crab or shrimp trying to hide. Both pompano jigs and the jig and grub can be used effectively in this application when Sarasota jig fishing. Jigs are very productive on the deep grass flats. Speckled trout in particular are suckers for a jig and grub combo, but bluefish, Spanish mackerel, pompano, cobia, flounder, sea bass, grouper, jacks, and ladyfish will all readily take a jig. The lure is cast out and retrieved back using a sharp “twitch”, generally from the 10:00 to 12:00 position. Most bites occur as the jig is falling, seemingly helpless. Anglers who keep the line tight as the jig falls will detect more strikes. A good rule of thumb regarding color is to use light colors in clear water and dark colors in darker water. Glow, white, gold, and silver are good colors when the water is clear. Olive, rootbeer, copper, and other dark colors work great in darker water. Another popular technique is to fish a jig two feet under a noisy cork. The rig is cast out, allowed to settle, then the rod tip is sharply twitched. This causes the cork to make a loud noise, attracting fish. It also causes the jig to jerk up and then slowly settle back down. The cork not only keeps the lure from hanging in the grass, strikes are easily seen as it disappears. A Gulp Shrimp works great with this technique. There are times when fish will respond to a steady retrieve while jig fishing. A slow, steady retrieve will produce when the water temperature is down a bit. When Spanish mackerel, bluefish, and ladyfish are actively feeding on the surface, a very fast retrieve will fool them. Anglers literally can not reel fast enough to get a bait away from a hungry mackerel. As the weather cools, the water temperature drops, and the hordes of bait fish that inhabited the bay in the summer migrate to warmer waters, artificial lures become more productive. While lures certainly catch fish all year long, they are even more effective this time of year. And no bait is as versatile or effective on a variety of species as is the lead head jig. Scented soft plastic baits on a 1/8 ounce jig head are deadly on redfish and snook when fished in shallow water around oyster bars and in pot holes. Root beer is a great color in darker water. The area from Stickney Pt. south to Blackburn Point is a great area to fish in cooler weather There are many oyster bars here and it is more protected on windy days. High tides in the afternoon are the best times to fish. Potholes in north Sarasota Bay near Long Bar and Whale Key will hold snook and reds when the water is clear. Shallow grass flats on both sides of Sarasota Bay exist from New Pass north. A shallow draft is required for this method of fishing. Shallow water jig fishing is challenging, but rewarding. A 4” or 5” swim bait on a 1/16 ounce jig head is a good choice. 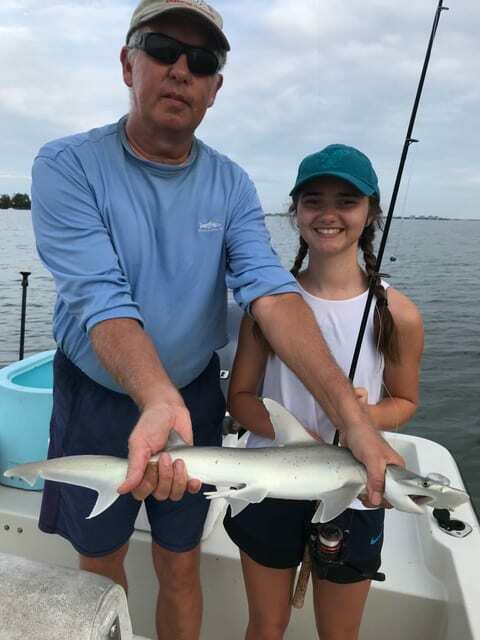 Depending on weather conditions, fishing can be very good in the inshore Gulf of Mexico for both surf fisherman and anglers in boats. Good conditions would be clean, clear water in the mid 60s. Jigs cast from shore will catch pompano, whiting, jacks, mackerel, and ladyfish. Tipping the jig with a small piece of shrimp can help a lot in the surf. This is particularly true in the winter when the water temperature is lower. Anglers fishing from boats in the inshore Gulf of Mexico will find jigs productive as well. 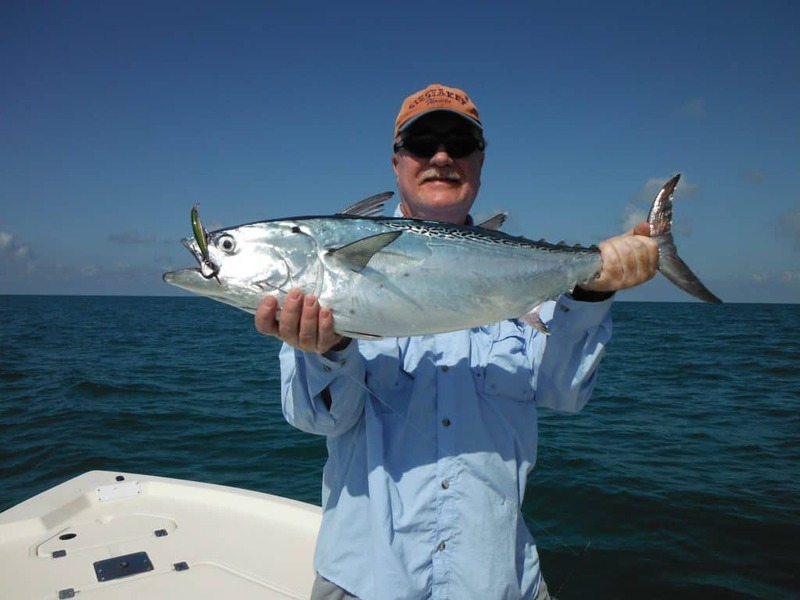 Anglers will target surface activity from breaking false albacore and Spanish mackerel. This is fairly easy fishing when the fish are this active. Just about any lure that is close to the forage in size and color will be devoured quickly. A very fast, steady retrieve will normally produce best. The jig and grub will produce some very nice snook in area rivers in the winter. Snook migrate up creeks, rivers, and residential canals to survive cold winters. I prefer a slightly larger bait as trophy snook are the target. My favorite is the Bass Assassin 5” Die Dapper swim bait. Dark colors are good with Golden Bream being my go to pattern. There are a lot of downed trees and other submerged cover in the rivers. Jigs with exposed hooks will hang up a bit more often than other lures. Using a soft plastic baits on a special hook that keeps the hook buried will help reduce snags. A jig with a wide gap, stout hook is required when jig fishing for snook. A 1/8 ounce is a good weight. The jig should fall slowly then reeled back in using a slow, steady retrieve. Snook can become a bit lethargic in the cooler water. However, they need to feed and bluegill, tilapia, and mullet are larger bait fish that the snook feed on. Larger baits tend to produce in this situation. 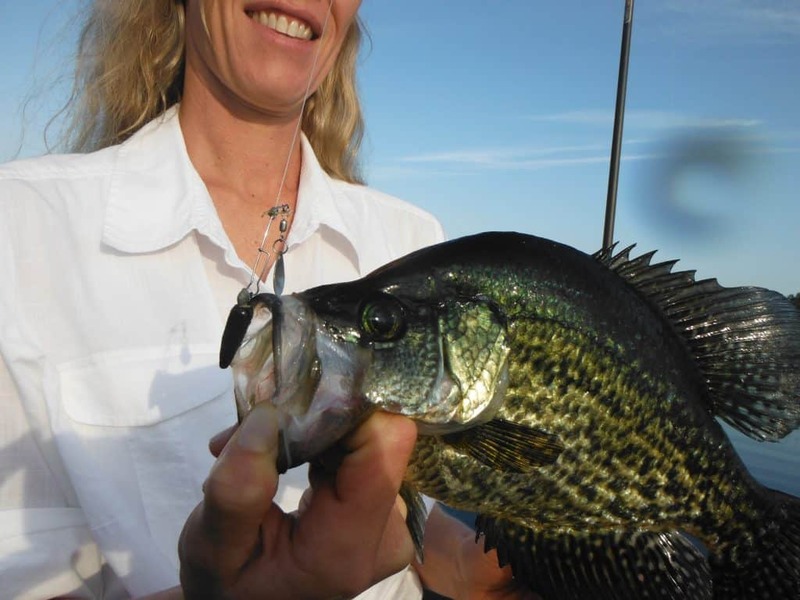 Small jigs are deadly on panfish when Sarasota jig fishing in area freshwater lakes, ponds, and rivers. Jigs have been used successfully all over the country for decades now. 1/8 ounce and 1/16 ounce jig heads with tiny twister tail and shad tail grubs will produce a lot of fish. Bluegill, crappie, and small bass will take these lures which mimic tiny bait fish that are found in these waters. There are many productive methods of catching fish. Sarasota trolling is a technique that every angler should add to his or her arsenal. Sarasota trolling techniques will help put more fish in the boat. Trolling is a technique that has proven to be extremely effective in saltwater fishing for a very long time. Most anglers envision a large sport fishing boat out on the open ocean, trolling for tuna and marlin. But trolling can also be deadly using fairly light tackle on inland waters, too. I am a fishing guide and troll on fishing charters in Sarasota Bay, the Myakka River, and Lake Manatee. During the cooler months, rivers, creeks, and residential canals offer anglers the chance to catch snook, jack crevelle, tarpon, and other species. Flats and passes can be productive all year long. Trolling produces in the Inshore Gulf of Mexico in the spring and fall. Crappie, bream, and bass will hit trolled lures in freshwater lakes and rivers. Trolling is a great technique to both locate and catch quality fish. Rivers, creeks, and residential canals abound all throughout the state of Florida and provide good fishing at one time or another. As the flats cool off, fish will migrate into these areas as they offer protection from the elements. The best rivers and canals will provide fish the sanctuary of deep water as well as abundant structure. The entire coastline of Florida offers these opportunities for anglers. Snook took a big hit in the winter of 2010 as a prolonged cold snap dropped the water temperature into the upper forties. I believe that if it wasn’t for the deep holes in the rivers where snook spend their winters, the damage would have been MUCH worse. Numbers of smaller snook are on the increase while larger fish are regularly landed. These are great signs and while snook were opened to a limited harvest, I still release all of them, even if a slot fish is landed in season. Snook are magnificent gamefish, it would break my heart to kill one. There are plenty of other good-eating fish to target, let those big girls go! Anglers have been catching snook by trolling for many years. Back in the 50s the Spoonplug was the hot bait, and it still produces to this day. I enjoy trolling shallow diving plugs and Rapalas are my personal favorite. Rapala X-Rap Slashbaits in sizes #8 and #10 in, depending on the depth of the water and the size of the available forage, and Jointed BX Minnows work very well trolled as well as cast. Firetiger, Gold Shiner, and gold are proven colors. These lures have a great built-in action and strong, sharp hooks. Most fish caught trolling will be hooked in the mouth, resulting in most being released unharmed. Another advantage with these plugs is that they float, therefore when the boat is stopped they rise to the surface instead of sinking and getting hung up on the bottom. Tackle and rigging for trolling is pretty straightforward. I use the same rods and rigging for trolling as I do when casting the same baits. A 7’ spinning or baitcasting rod and reel with 40 lb braid and 30” of 40 lb fluorocarbon leader is all that is required. Then it is simply a matter of letting back a hundred feet of line and driving up the river or canal at idle speed or a touch above. Florida rivers tend to undulate; the depth will change quite often. Many times the fish will lie on these breaks or edges, waiting to ambush bait; fish-holding structure is not always visible. It is surprising how many big fish will bust a plug right out in the middle, giving the angler a good chance to land it. I have my clients on a Sarasota fishing charter hold the rod when trolling, for several reasons. First off and most important, it is more enjoyable as they get to feel the strike. Also, the lures I use don’t dive very deep, so having the client keep the rod near the surface maximizes the depth that the plug will run. These plugs “vibrate” and if a piece of debris is picked up the angler can usually feel it and then clear the bait. And finally, it can be a bit tricky removing a rod from the holder when the boat is moving and the rod is bent double! Trolling with light tackle also produces very well inshore. I do a lot of drifting on my Sarasota fishing charters, both in the passes and over deep expanses of grass. There are usually other anglers fishing, so courtesy dictates a slow idle back around to make another drift. Since we will just be easing along, why not drag a bait behind? My go-to lure is a #8 X-Rap in olive or glass ghost (white), it has been very productive as it matches the bait we have in our area. Once the treble hooks get beat up, I remove them and add a single 1/0 hook on the rear. The hook-up ratio remains good and it makes releasing fish MUCH easier. In fact, some plugs now come with a strong single hook for just this reason. Again, just let out about half the spool and move at idle speed or just above. Many times clients catch more fish doing this than they do when drifting and casting. 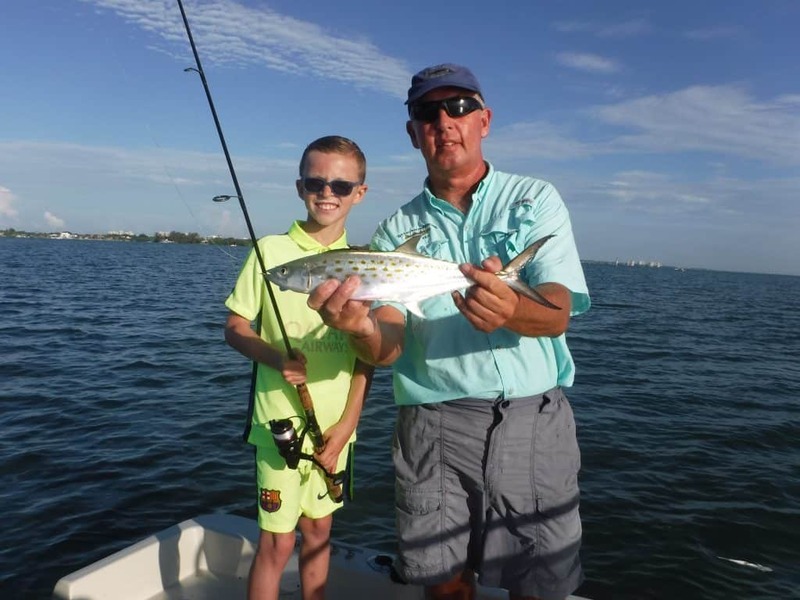 Spanish mackerel in particular find it difficult to resist a fast moving plug, but bluefish, ladyfish, jacks, trout, and other species will also fall prey to this method. One technique that often pays off is the twitch the rod tip sharply while trolling along. This will often times elicit a violent strike! Fish find the little pause where the plug drops back to be irresistible at times. Trolling is also a good technique to employ when fish are scattered about over a large area. The best approach is to move into the tide or wind and when a fish is hooked the boat is stopped. Anglers can then cast jigs, plugs, or spoons as the boat drifts back over the school. As action drops off, resume trolling again until another bunch of fish is found. One benefit to this is that the same lures that are great trolling baits are also equally effective cast out and retrieved back in; there is no need to have separate trolling and casting outfits. Trolling will produce at the same spots inshore as other methods. Grass flats in four feet to ten feet of water will hold speckled trout, mackerel, bluefish, ladyfish, and other species. Edges of drop offs are good spots to try as well. 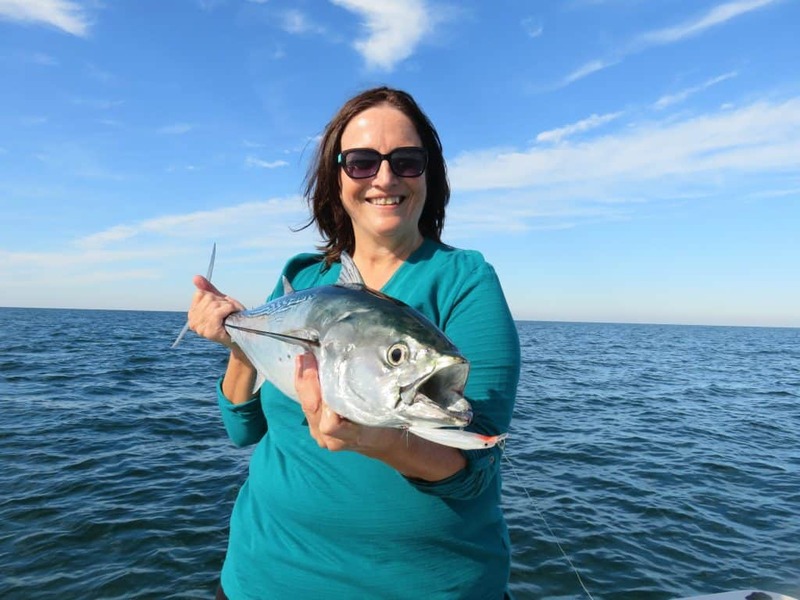 Both Big Sarasota Pass and New Pass are terrific spots to troll for Spanish mackerel and bluefish. These open sandy areas are large and trolling is a great way to locate fish. Sarasota trolling has been a staple of anglers fishing the inshore Gulf of Mexico for many years. Pelagic species such as king mackerel, Spanish mackerel, false albacore, and cobia migrate along the west coast of Florida. These game fish follow behind the huge schools of bait fish. This is their primary forage. A fast moving plug or spoon mimics the prey. This is a very easy technique than any angler can employ to catch a big fish! Plugs are a great choice when Sarasota trolling. The larger the lip on the plug, the deeper it will dive. Fairly stout tackle will be required when trolling a large plug. Conventional tackle in the 30 pound class is perfect. Heavy spinning tackle will work as well. A plug that dives down fifteen feet or so is perfect to target a large king mackerel. I prefer to use a 5′ piece of 80 pound flourocarbon leader instead of wire. Wire will prevent cut-offs but will limit strikes. Game fish will hold over hard bottom, ledges, and artificial reefs. Sarasota County has an extensive artificial reef program. Several are close to shore for anglers with a small boat. Ledges and good bottom can only be located by spending time out on the water. Once located, these spots will produce year after year. Bait schools milling on the surface can be an indication of structure below. Small plugs can also be extremely effective in the Gulf of Mexico off of Siesta Key beaches. Often times the bait is very small. A #8 Rapala X-Rap is a prefect match for the smaller forage. White is a very productive color. Surface activity will alert anglers to the presence of game fish. Mackerel and false albacore can be seen terrorizing helpless baitfish on the surface. The best approach is to skirt the edge of the feeding fish. Do not drive the boat right through the action. They will go down and may not resurface. Spoons also produce a lot of fish. Clark Spoons and other manufacturers make special spoons designed for trolling. Spoons can be used when trolling in a couple of different ways. Due to boat speeds, some type of device is needed to get the spoon down in the water column. The easiest method is to tie a trolling sinker to the end of the line. These are torpedo shaped and come in a variety of weights. A ten foot long leader is tied to the sinker and then a trolling spoon is tied to the tag end. This is really quite simple and deadly on Spanish mackerel. Planers are another device used to get spoons down deeper. They are effective but are a bit more complicated. The planer is tied onto the running line. A twenty foot leader is attached to the planer, followed by the spoon on the tag end. Planers come in several sizes, but #1 and #2 planers are the ones used in shallow Gulf of Mexico water. A #1 planer will dive five to seven feet. A #2 planer will dive down around fifteen feet. The planer must be “set”. This is done by slowly lowering the planer into the water after the spoon is let out. With the ring up, water pressure will pull the planer down. The planer is then let out behind the boat to the desired length. The rod is then placed in a holder. When a fish hits, the planer will “trip”, allowing the angler to fight the fish without the drag of the planer. Plugs can be used with planers, but they must have a small lip. Large lips will trip the planer. Speckled perch (crappie, to our northern friends) are a favorite of Florida anglers and trolling for them has become a very popular. The basics are the same, but the technique is a bit different. As in other applications, trolling allows an angler to cover a lot of water in a short amount of time. Jigs are most often used, but Beetlespins are also effective. The Blakemore Roadrunner is a very productive bait that combines both a spinner and a jig in one lure. Some anglers use spider rigs and other elaborate set-ups to get as many lines in the water as possible. I prefer to keep it simple; once again having my client hold the road and enjoy feeling the strike. On deeper lakes with distinct contour changes, the best approach is to very slowly troll back and forth over edges where the bottom changes depth, crappie will often hold in these locations. Changing speeds on the turns will cause the lures to rise and fall, triggering strikes. On shallower lakes, just drive around, skirting the edges of weedlines or over submerged vegetation until the fish are located. On the flat, shallow Florida lakes, even the slightest depth change can make a huge difference. Locating a trough or hole in a featureless lake will result in a reliable fishing spot. So, the next time you are idling along on your favorite lake, river, or inland bay, try dragging a lure out behind the boat. You never know what might eat it! 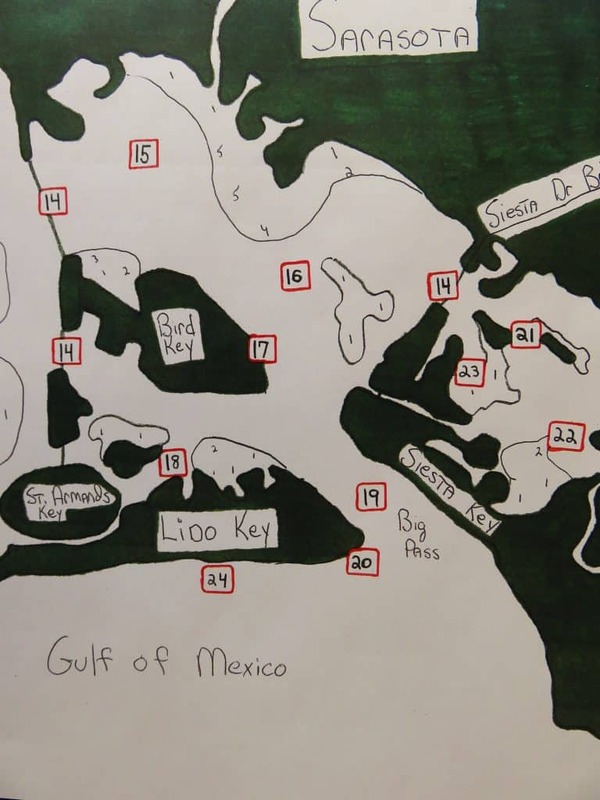 Sarasota summer fishing charters are a bit complex. It is July and I have a dilemma. The water temperature is in the mid 80s and Sarasota Bay is full of bait fish. Artificial lures can be effective but live bait is tough to beat. Also, the idea of using the early morning “prime time” to catch bait is not appealing. So, what to do? Simple; take advantage of the first light bite by casting lures and mid-morning when things slow down a bit, fill the well with bait and use it to get the fish cranked back up! Using lures early then switching to live bait later in the morning is a strategy that I use on my Sarasota fishing charters all summer long. Bait is abundant, particularly on those flats near the passes where I often fish, that the speckled trout and other species can be difficult to fool on a lure. The exceptions to this are the low light periods of dawn and dusk when game fish are actively feeding. I also run a lot of family charters that include novice anglers and children. Live bait is the ticket to bent rods and smiling faces. In these instances, live shrimp can replace lures to take advantage of the early bite. 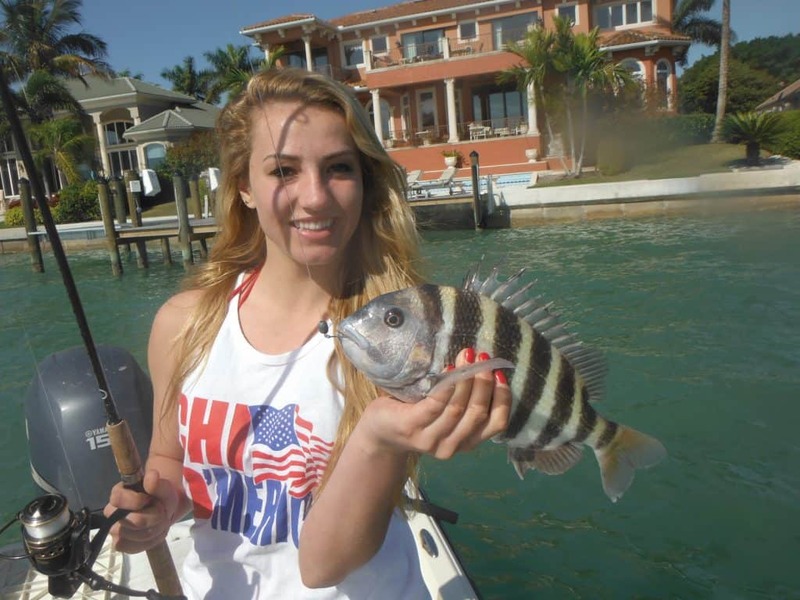 At some point the pinfish will become a nuisance, requiring a change to bait fish. Plug, jigs, and spoons are three very effective and versatile lures on Sarasota summer fishing charters. High tides first thing in the morning will find my clients casting Rapala X-Raps in the (08) size over bars and edges of grass flats. Olive and white are my two top colors. White mimics the “whitebait” that is often present. It works very well in clear water. Olive looks a lot like mullet as well as greenbacks and is a great all-round finish. Baitfish being present at these spots only increases the chance of success. Snook will also attack Rapala plugs when cast around mangrove shorelines and oyster bars at first light. These baits dive several feet below the surface and are deadly when retrieved back in using sharp twitches with a pause in between. Topwater plugs will elicit explosive strikes on fishing charters! Topwater baits will generally catch less fish, although often times larger ones. The Rapala Skitterprop is my personal choice. This bait has a tapered nose and a propeller on the rear. It make a decent amount of commotion when twitched sharply. Gold is a productive color pattern. Some of the largest trout will be landed using plugs in shallow water at dawn. Suspending plugs such as the MirrOlure are great for speckled trout over the grass flats. The venerable 52 series has produced a lot of fish over the years. A recent addition is the MirroDine looks very much live a scaled sardine, which is a prime forage bait for inshore species. These baits work best in slightly deeper water. They will hang up in the grass if used on the very shallow flats. The lead head jig/plastic tail combination is a proven bait all along the Gulf Coast of Florida. Bass Assassin jigs are very popular in our area. They are available in a wide variety of sizes and colors. My personal favorite on fishing charters is the 4” Sea Shad tail on a ¼ ounce jig head. This is a great bait to use when fishing over deeper grass flats for trout, pompano, and whatever else finds it attractive. Light colors such as gold, silver, and glow work well in clear water while rootbeer and olive are effective in darker water. Lighter jig heads can be used when fishing in shallow water. Jigs are very versatile along with producing a lot of fish. The best technique is to cast it out ahead of a drifting boat in six feet to ten feet of water that has grass on the bottom. After allowing the bait to sink for several seconds, it is retrieved back using sharp upward twitches. Most bites occur on the fall. Flats that have bird activity or bait fish schooling on the surface are great spots to try. Pinfish can be a problem if the bait is worked too slowly. They will bite the shad tail off when present. Scented baits can make a huge difference, especially when conditions are tough. The best scented bait, by far, is the Gulp! Line of baits. I prefer the 3” Gulp! Shrimp on a ¼ ounce jig head. Color really does not matter that much, it is all about the scent. They really are like using live shrimp! New Penny, glow/chartreuse, and rootbeer/chartreuse are my top producing colors. A Gulp! Shrimp fished ender a noise popping cork is deadly on speckled trout. Spoons have been around forever, and to this day are still productive lures. They are great for prospecting as they are easy to cast long distances, allowing anglers to cover a lot of water. Spoons basically come in two styles; either weedless with a single hook or with a treble hook. Gold and silver are the two most popular finishes. Weedless spoons are great for enticing redfish in very shallow water. The treble hook version is a good choice when fishing open water. Spanish mackerel are particularly vulnerable to a quickly retrieved silver spoon. Spoons work very well whenever fish are seen actively feeding on the surface. 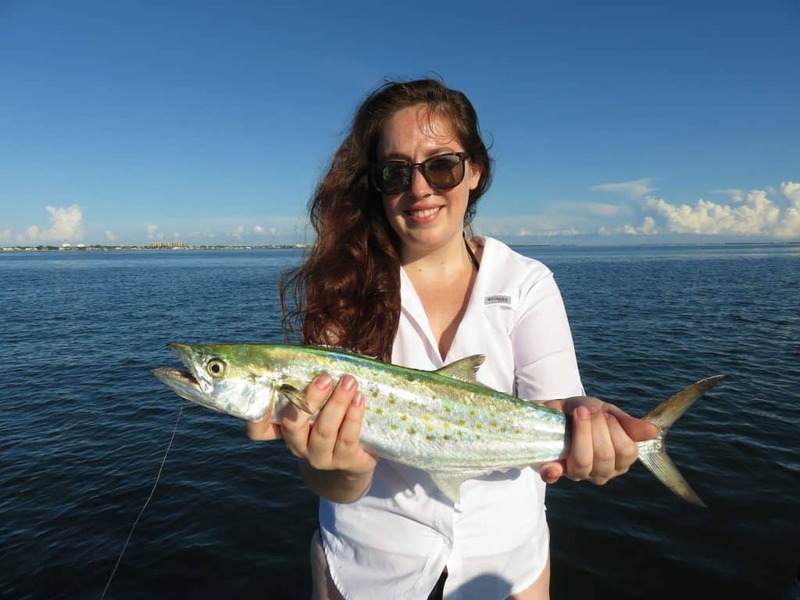 Fly fishers are certainly not to be left out of the action on Sarasota summer fishing charters! A fly looks exactly like the small bait that is prevalent on the flats. A #1 white or white and chartreuse Clouser Minnow is tough to beat. A 7wt or 8wt outfit works well. Floating lines work well in shallow water while an intermediate sink tip line would be the best choice in water over four feet deep. Weather and tide will play a part in my strategy for the morning. Strong tides and a little breeze will usually result in lures being productive later into the morning. Conversely, a still morning with very little water movement will mandate a switch to live bait earlier than normal. Fortunately, bait is usually pretty easy to acquire this time of year. I prefer a light, eight foot net. It is easier to throw and empty. But, many anglers use nets up to twelve feet in diameter. Bird activity will give away the location of the baitfish. Shallow flats near passes are prime spots to find scaled sardines (pilchards) and threadfins. Sloping points are great spots. Bait fish will position themselves on the up-tide side. Edges of flats can be good as well. Incoming tides are usually the best time to catch bait. Bait will vary in size. All will work, but small bait can be problematic. It will hang up in the net and is a bit more difficult to cast. Small bait-stealers can also be a nuisance. The perfect sized bait for fishing the deep grass flats is around 2”. Once located, a good toss or two with a cast net should result in a well full of frisky bait. The ideal situation is when baitfish are dimpling up on the surface. Easing into range quietly should allow the angler to get a good cast over the bait. If bait fish are not visible on the surface, they can be chummed into range using canned mackerel or cat food. The same types of spots will produce. Chumming will also result in small pinfish and grunts being captured along with the other bait fish. Once the bait is obtained, fishing begins. This is a proven tactic on Sarasota summer fishing charters. The technique is pretty simple but as with any other method, subtle nuances can make a big difference. Basically, I anchor up-current of a grass flat in four to eight feet of water. Then, I toss out a handful of bait and if fish are around it won’t take long before they start “busting” the baits on the surface. Baits are pinned to a 1/0 hook and cast out; a hookup should promptly ensue. A small split shot may be required to get the bait down in the water column. Speckled trout, Spanish mackerel, bluefish, sharks, mangrove snapper, jack crevelle, flounder, and ladyfish are all commonly caught using this technique over the deep grass. This technique does require a decent cast net, a large live well, and a little patience. A quality cast net is a great investment. It will pay for itself in just a few trips. As with all other fishing equipment, better nets will cost a bit more money. However, the payoff can be non-stop action all morning long. Sometimes clients choose to finish up a Sarasota fishing charters trying for a snook, redfish, or big jack. This does require that the bait be fairly large, in the 3” range. Smaller bait will not work nearly as well. 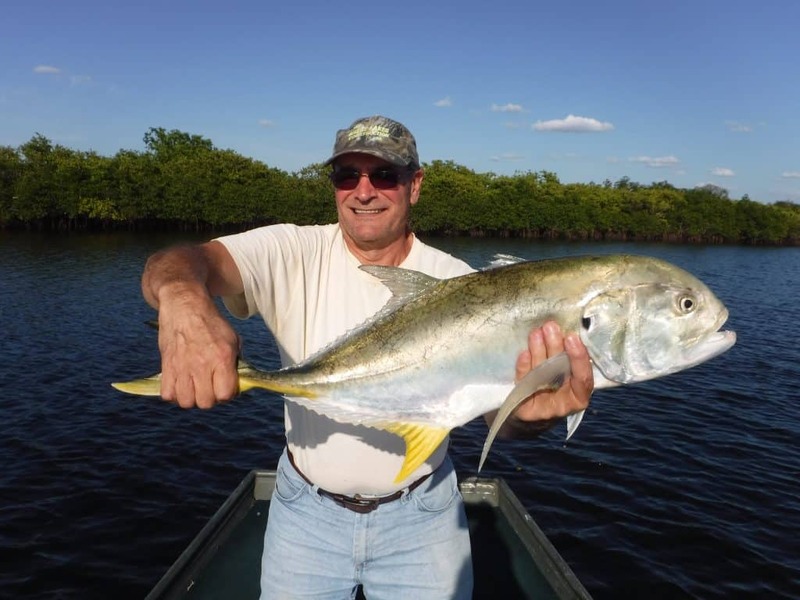 Anchoring near a mangrove point and chumming will lure the fish into range. I have also landed some large mangrove snapper along with the snook and reds when using this technique. This is a great option as it produces even at mid-day. In the summer, snook will school up thick in both Big Sarasota Pass and New Pass. Structure in the passes such as rocks, docks, and bridges will hold fish. Mangrove shorelines with a bit of depth are prime spots as well. Less chum is requires as the baits are larger. The idea is to get the fish excited, not full. Being judicious with the use of chum is a good idea. 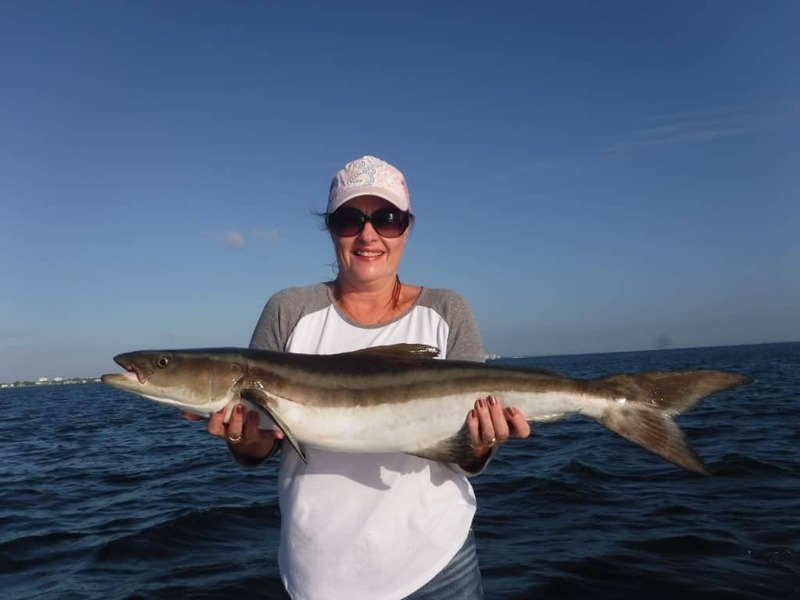 Tackle requirements for snook fishing charters are a bit different. Stouter tackle will be required around the structure. A 7 foot rod with 20 lb braided line is a good combination. 30” of 30 lb or 40 lb flourocarbon leader and a 2/0 short shank live bait hook or #4/0 circle hook completes the basic rig. Weight will be required when fishing deep water in the passes with current. A swivel between the braid and leader with the egg sinker on the braid works well. Anglers should use just enough weight to hold the bottom. Large jack crevelle, redfish, and other species will be taken this way as well. In the late summer, some large mangrove snapper will please anglers on Sarasota fishing charters who seek a fish to invite home for dinner. The rocks at the north end of Siesta Key in twenty feet of water is a very good spot for snapper. The New Pass Bridge is a good spot for both snapper and snook. Occasionally, a large tarpon will be hooked under the bridge! 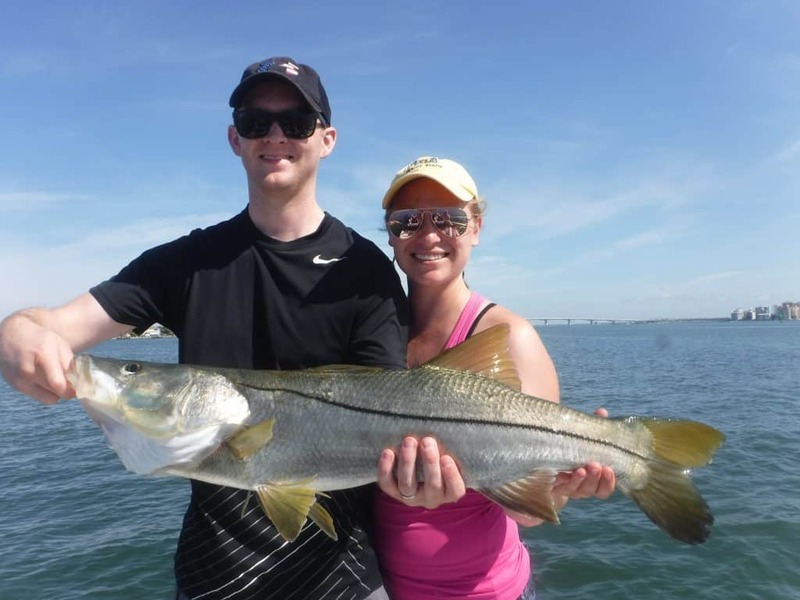 Anglers that choose to fish on their own can catch plenty as snook right off of the beaches. Snook move out to Sarasota Beaches to spawn in the summer. When conditions are right, which means clear smooth water, snook can be seen right in the surf line. The idea is to see the fish, then determine which way it is moving. A lure, bait or fly is and cast out ahead of the fish. Hopefully a bite ensues. This really is world-class sight fishing. It offers anglers the chance to see the fish, stalk it, cast to it, and catch it! One of the great things about this type of fishing is that light tackle can be used. There is very little structure out on the beach for fish to break off on. In closing, the fishing in the summer can be fantastic! Anglers just need to change tactics a bit. Versatility and the ability to adapt to conditions are the keys to success, along with understanding how the warm water affects the bait and game fish. Some of my most productive Sarasota fishing charters for both action and variety occur in the summer. Most days we land around eight to ten different species and while I promote catch and release, most clients can take home a meal if desired. Anglers who want to get in on this great action need to get up early, drink a lot of water, and enjoy some “Hot” summer fishing!